It’s the last chapter in this saga! 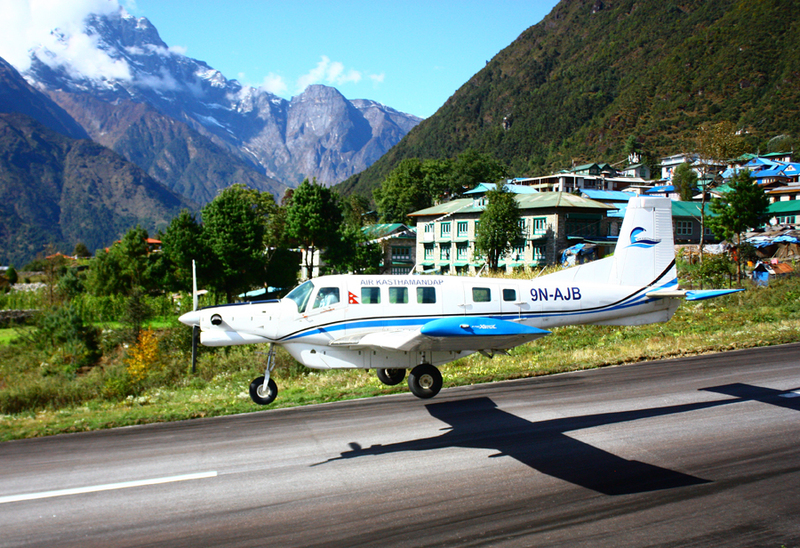 This will return us back down to Lukla. 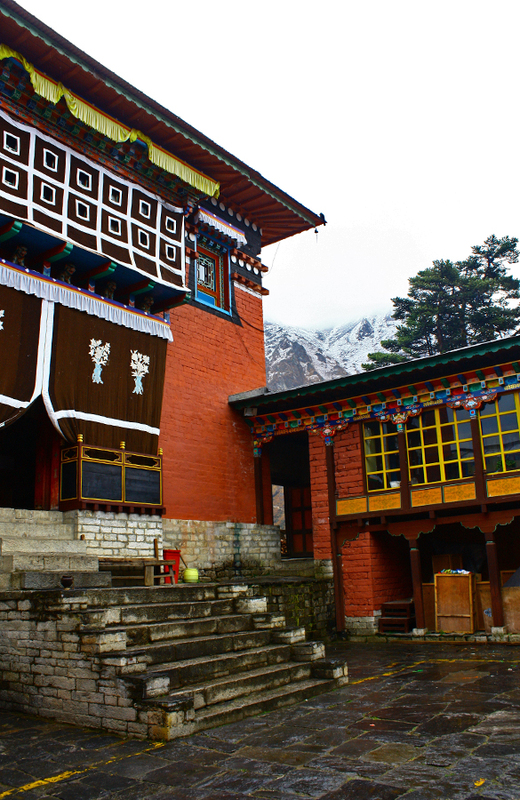 We left Pheriche for Deboche and finally lost our lucky streak of good weather. As you can see above, it began as overcast and became cloudier as the day progressed. I had also developed a fun new problem– my coughing had quieted a bit but I had developed a bruised rib from all of the coughing. 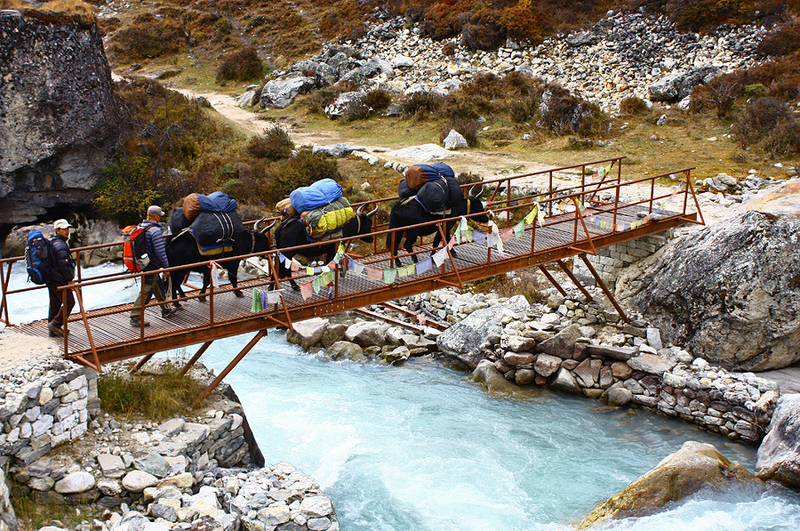 Above are our dzopkyo crossing a bridge. They were, for whatever reason, quite fussy that morning. 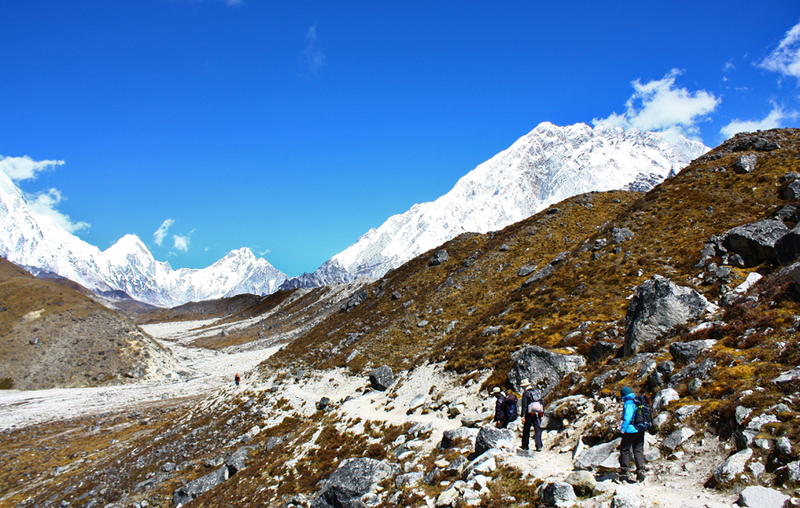 Unlike our ascent, which followed a somewhat indirect scenic route, our descent lead us along the main Base Camp trail. 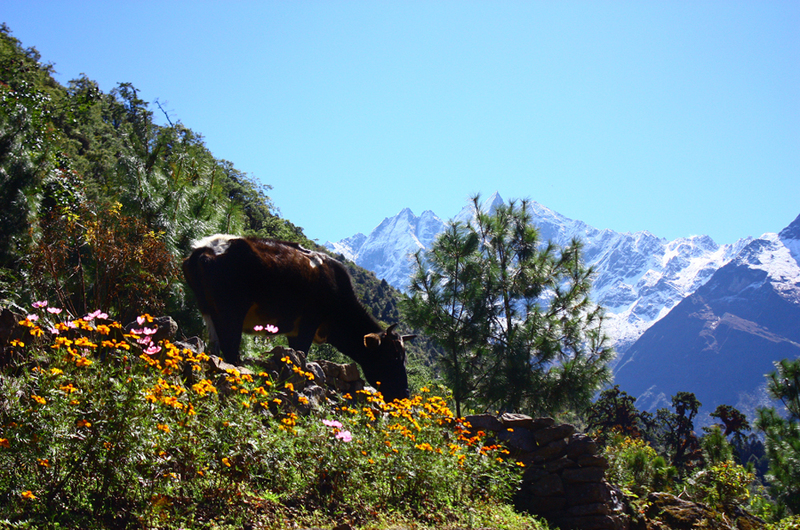 The trekking was fairly easygoing and still very picturesque. 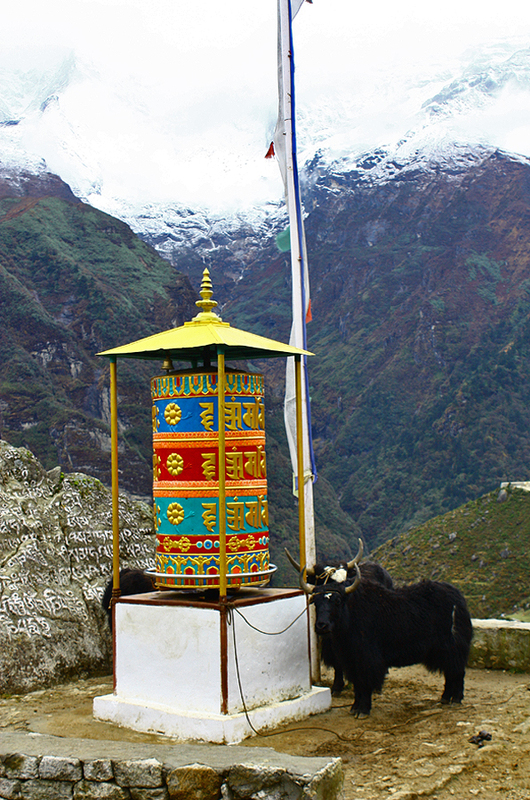 We were still high enough to see plenty of yaks traversing the trail. But I was so bummed about the weather! The clouds made the mountains difficult to see. Cue the Benny Hill music. 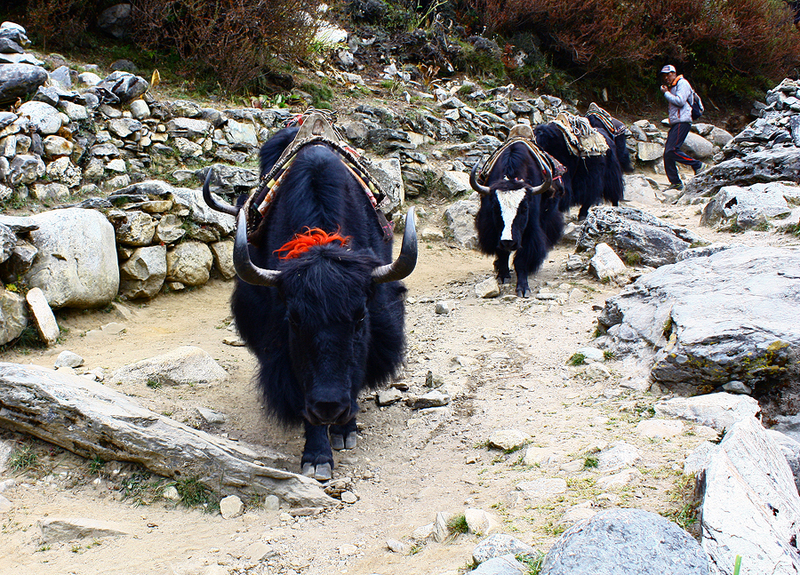 There were a lot of yaks on the trail. 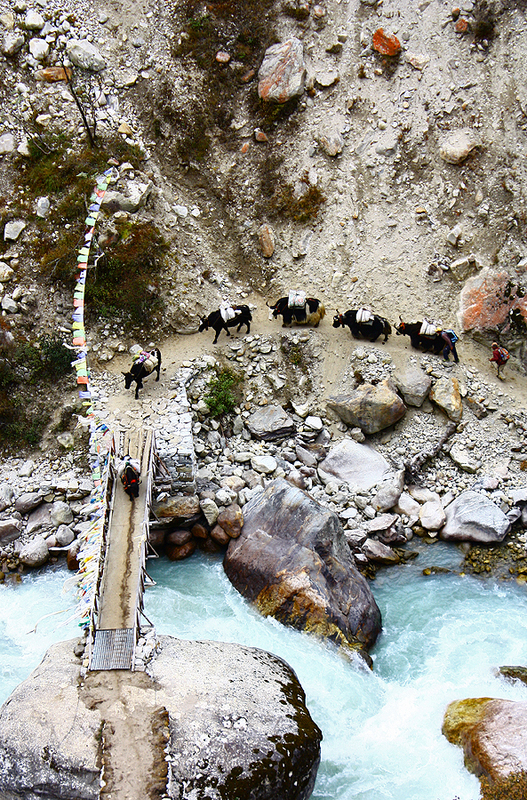 Here are the yaks that were crossing the bridge, up close and personal. I was always a little nervous being around such big animals, even if they do have colorful little floof balls on their heads. 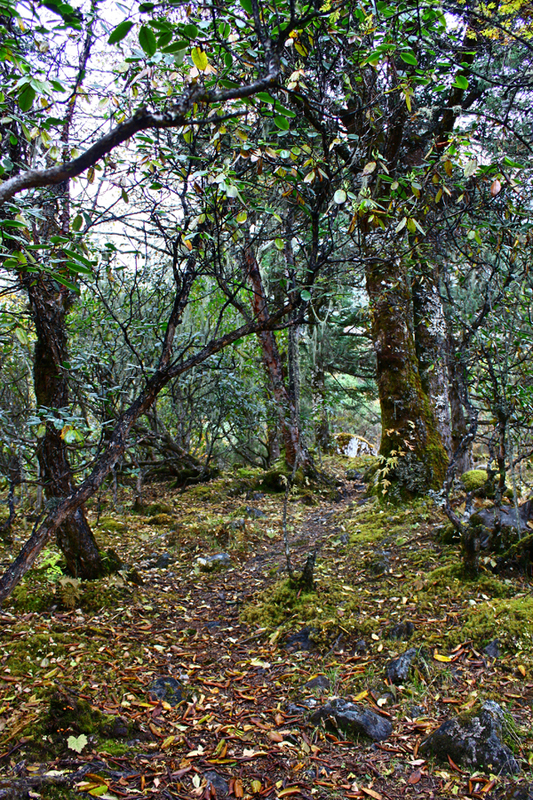 After some river crossing, we made our way through a small forest. I really liked the old man’s beard on the trees (sort of visible in the picture to the left). I had never seen that before! Other than that, the forest again reminded me of the forests back home. 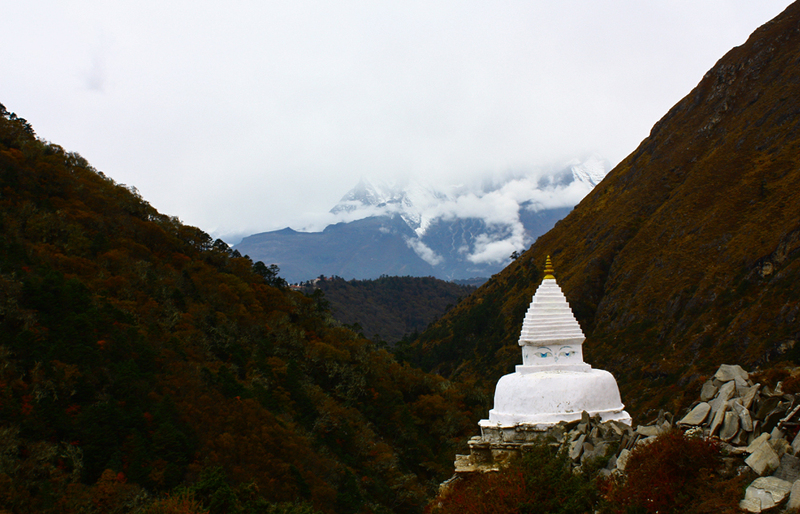 After walking through the forest a bit and passing the mani wall above, we stopped to camp in Deboche, just as the rain started in earnest. We were pretty much in the middle of nowhere, so I spent most of my afternoon in my tent, listening to the rain fall. That night, as I was brushing my teeth outside of my tent, I saw a horse on the other side of the field. I was not super pleased that there was a horse wandering the field our tents were in (I’m a little horsephobic) but figured he was far enough that it wouldn’t matter. Later that night, I woke up at about 2 AM and my foot brushed up against something outside of my tent. And that something moved. I FREAKED out and immediately pictured the stupid horse I had seen earlier sitting on the entrance of my tent. I was now wide awake and mustering the courage to go outside and have a fight in the dark with a fat horse intent on sitting on my tent. I slipped out the back exit, creeped to the front of my tent, and…there was nothing there. Feeling a little insane because I knew my foot had hit something, I zipped open the front flap and found a stray dog lying in the antechamber of the tent, clearly seeking shelter from the rain. He looked up at me imploringly, and I felt (1) relieved I didn’t have to fight a horse and (2) terrible for even disturbing the poor dog. 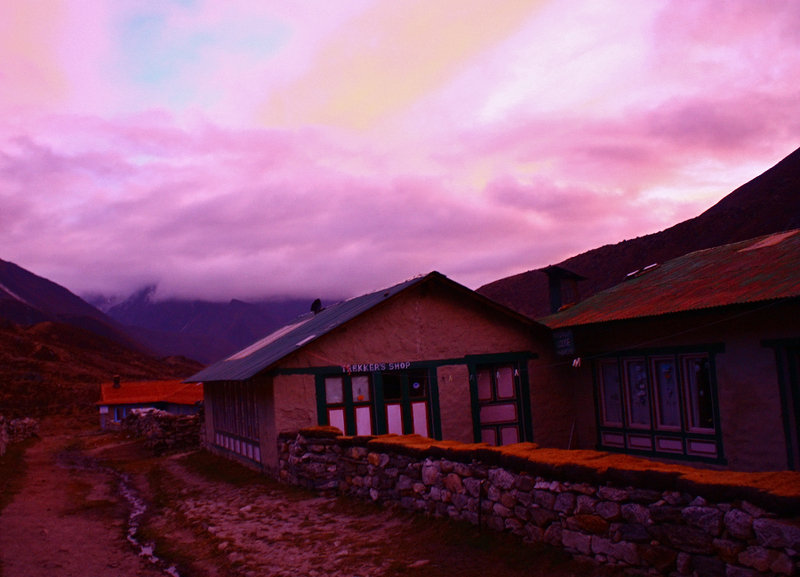 And that was my 2 AM animal adventure in Dengboche. If this isn’t the shadiest horse you’ve ever seen, you need to stop hanging out with such shady horses. 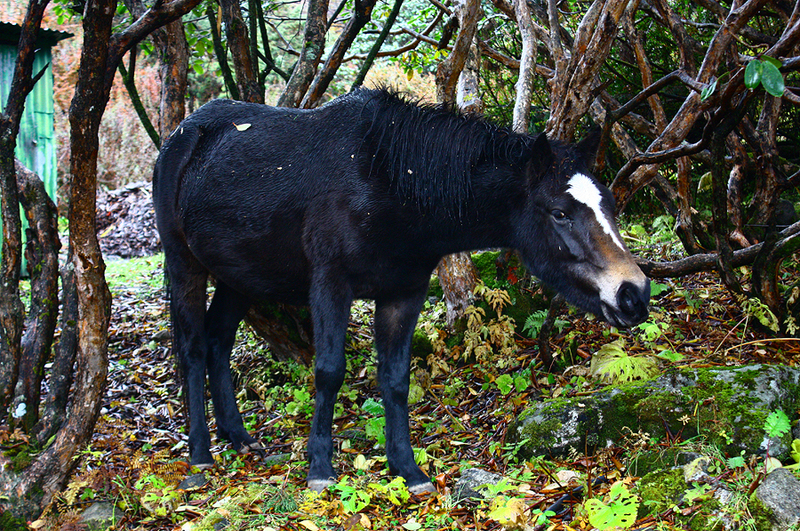 The next day I saw this shady horse. I half expected him to offer me some drugs. He was lurking near a bathroom that belonged to the teahouse we had breakfast in (you can see it in the left of the picture– the green metal). The bathroom had the most complex lock I had ever seen. I half expected to find a stash of gold in there, instead of a hole in the ground. And I was nervous to be encased in a metal box with this shady character lurking nearby. 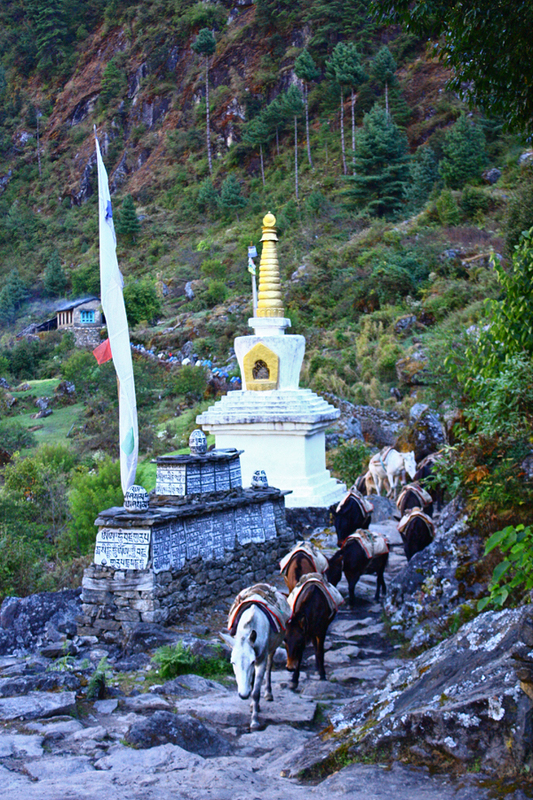 Anyway, we left the shady horse and Deboche behind and made our way up (in the mud and rain) to Tengboche Monastery. 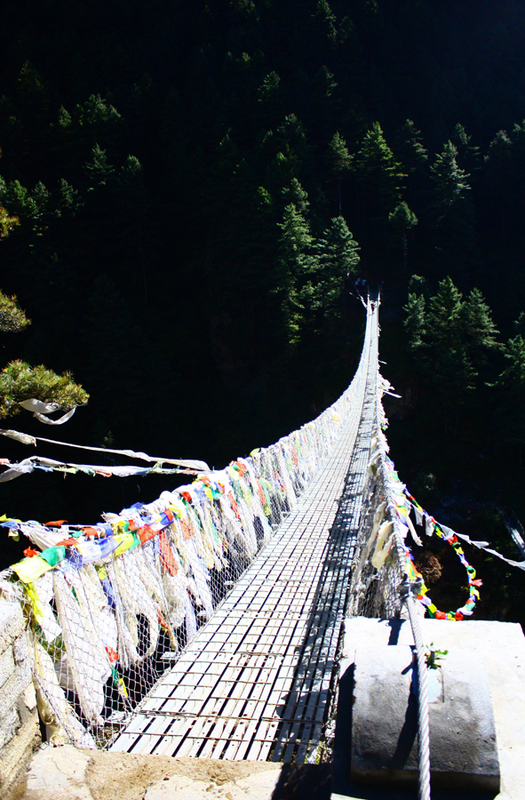 After a fairly brief visit, we continued on our way to Namche Bazaar. 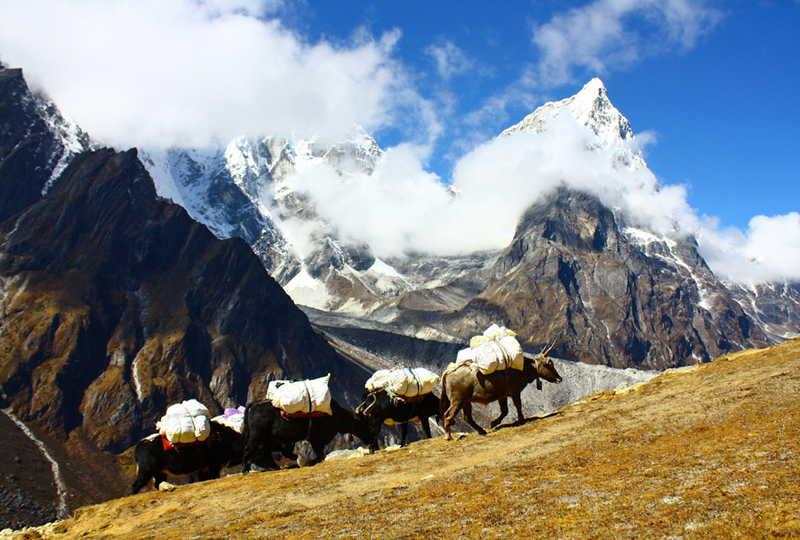 This was probably the most miserable day of trekking. It was rainy, cold, and muddy and the rapid-fire descending (we lost about 4000 feet in the span of an hour or two) killed my knees and made me regret not bringing trekking poles. 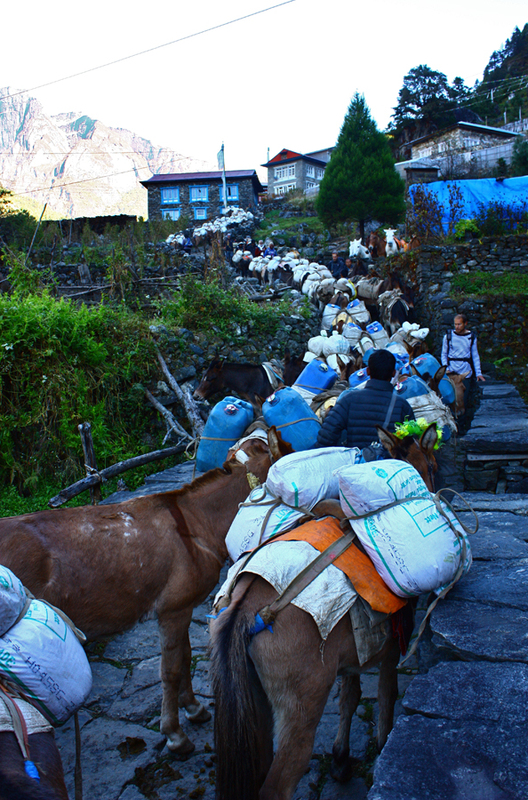 I felt like a whiner for complaining, however, when I saw all the porters on the trail. I’ve sort of alluded to porters throughout this little saga, so I’ll explain here. There are no cars at all on this trail. 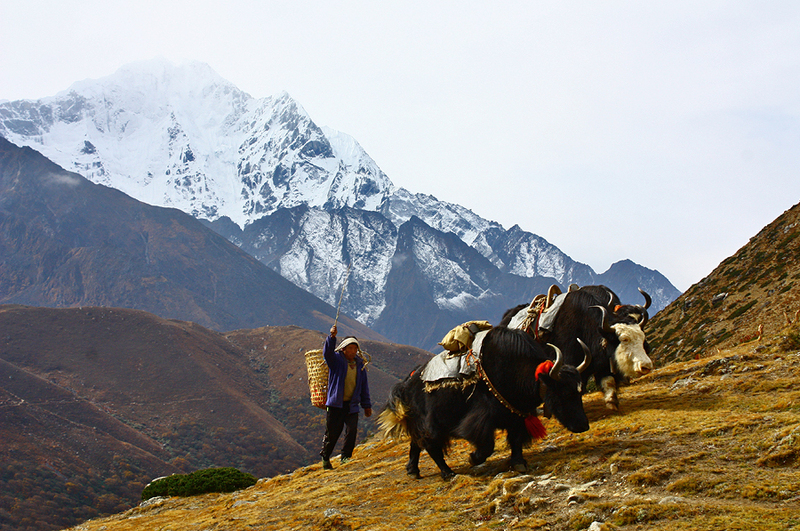 To get supplies up or down the mountain, they must be carried by either humans or animals. 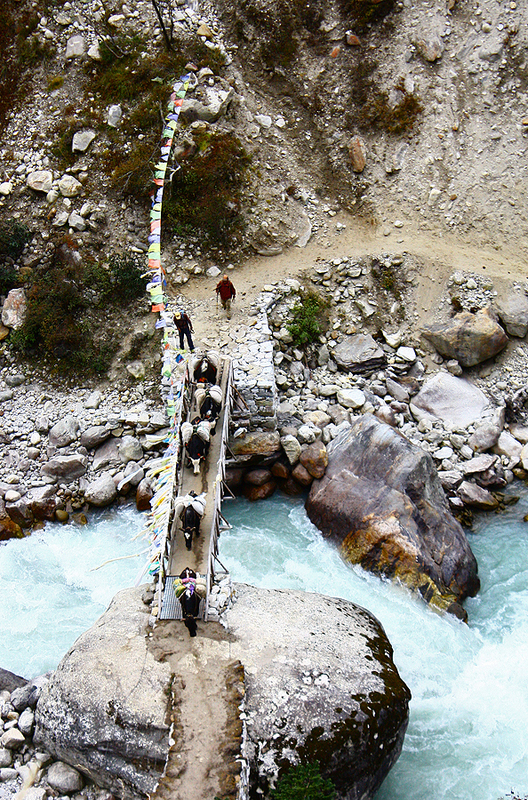 The physical abilities of these porters almost defies logic. 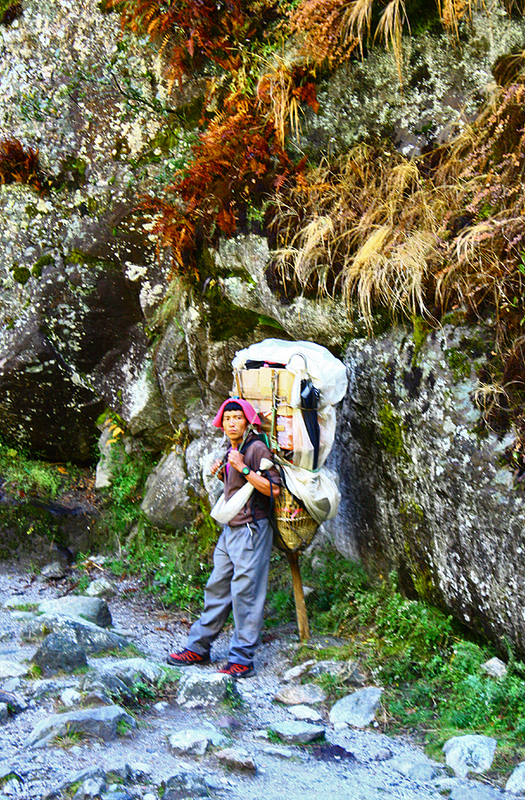 Oh, you know, just carrying a door and a bag twice the size of my body up a mountain side. No big deal. Are they building a rocket ship at the top of this mountain? I really hope these guys are very well paid. 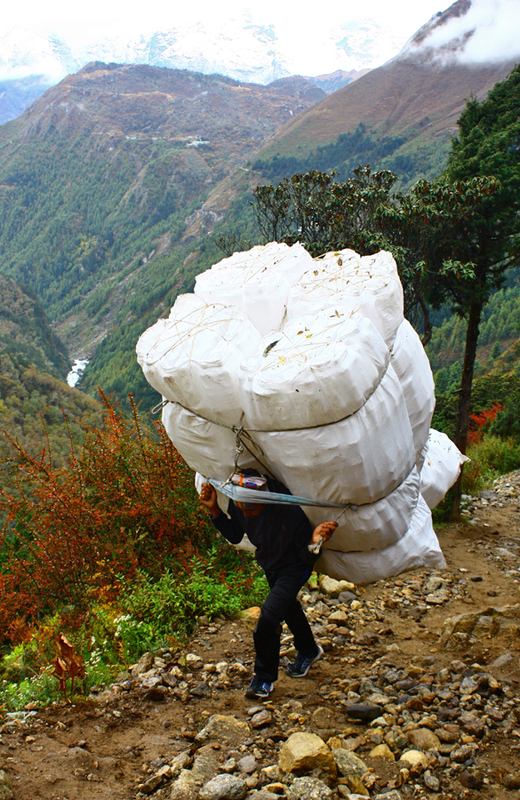 I was told by our sherpa that they are paid the same regardless of the size of the load. 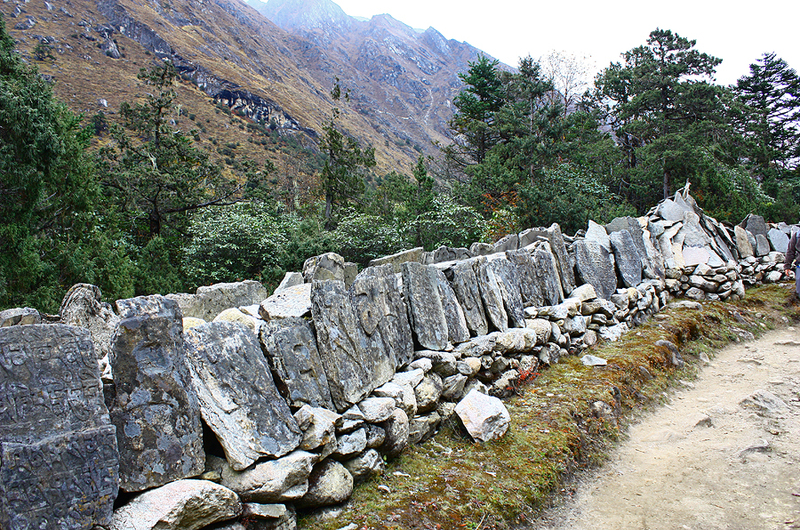 The trail finally linked up with the trail we had originally taken out of Namche and things began looking more familiar. 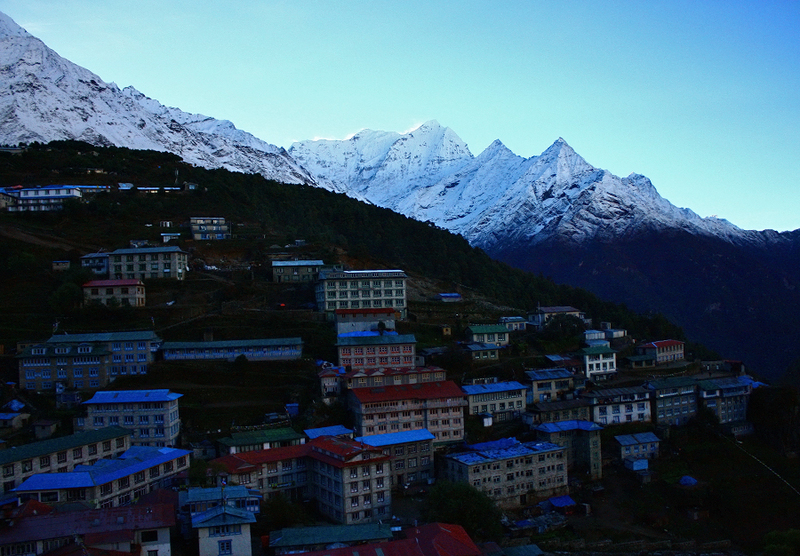 We finally found ourselves back in Namche Bazaar and staying in a lodge for the night. As it turns out, our timing could not have been better. 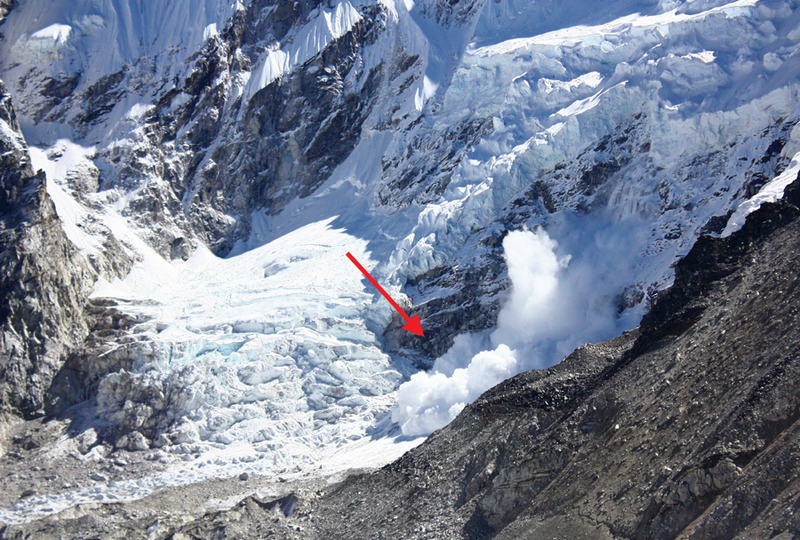 Perhaps you heard on the news about that horrible avalanche disaster in the Annapurna area? 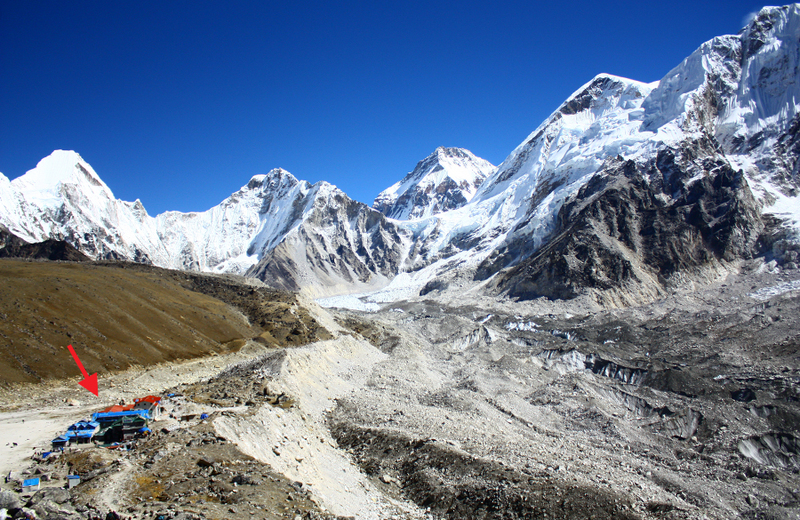 The Everest Base Camp circuit was hit with the same storm system, albeit not nearly as badly. While those at a higher elevation received snow, we experienced horrible thunderstorms and vicious rain and wind. I watched it from the window of the lodge and felt so thankful to not be in a tent. …was flawless sunshine! I couldn’t believe our luck with the weather. 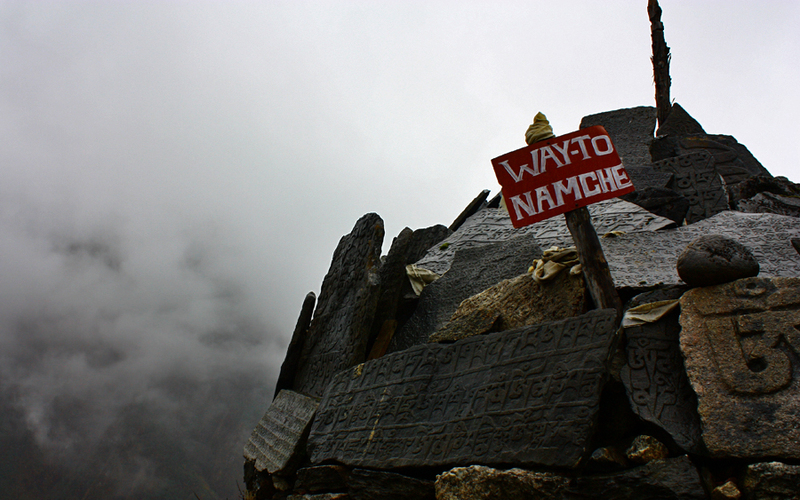 We sadly left Namche behind. 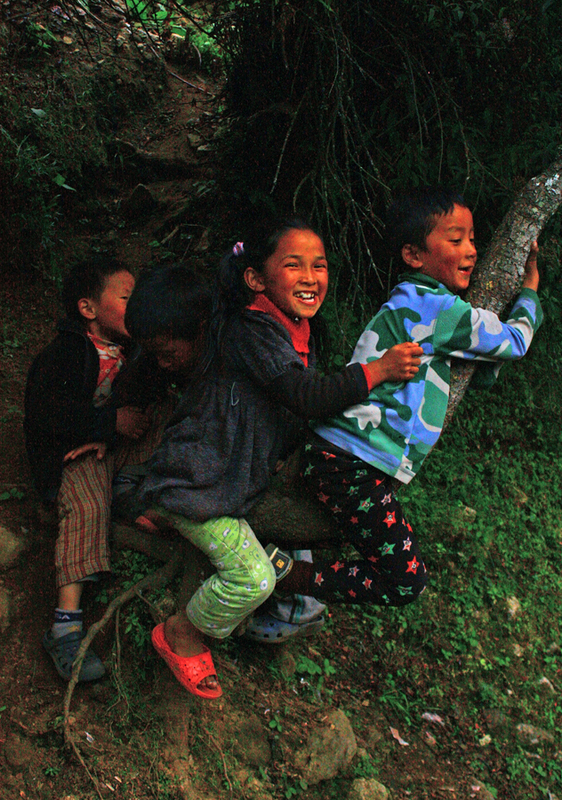 But were seen off by a bunch of young and friendly Namche residents who wanted fist pounds and high fives. 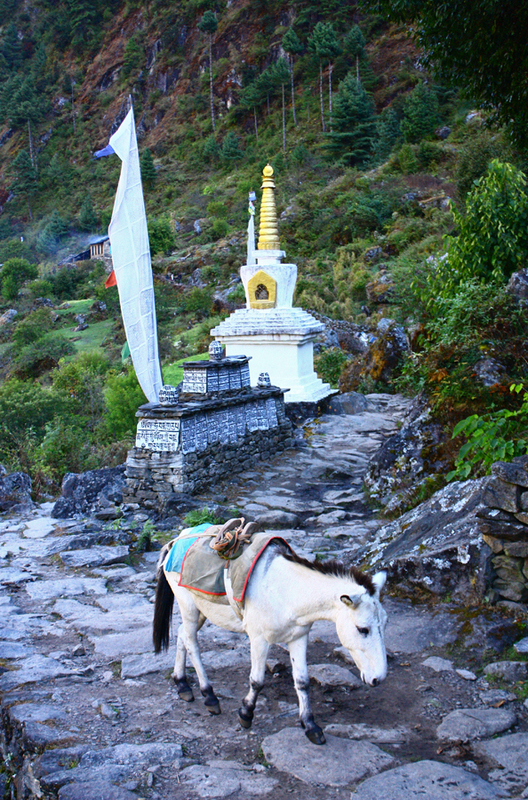 We then followed the same trail back down to Phakding. 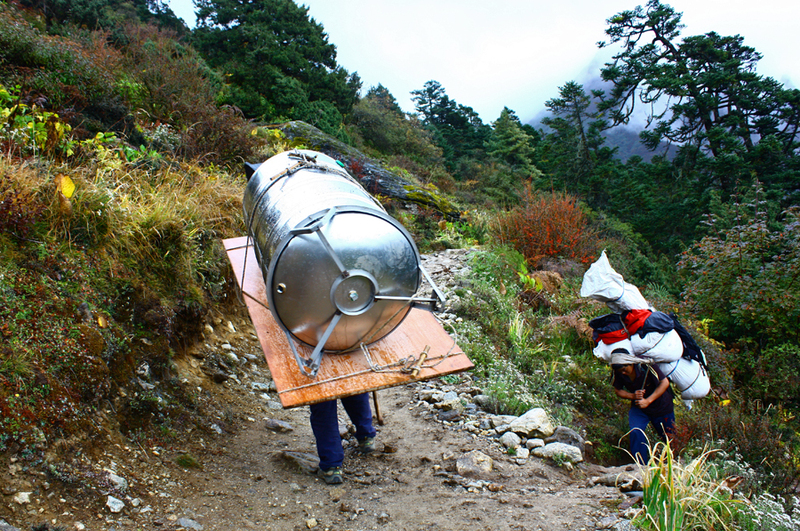 And I saw more impressive porters. He has to climb all those stairs with that heavy looking load. Taking a break and then starting on his way. 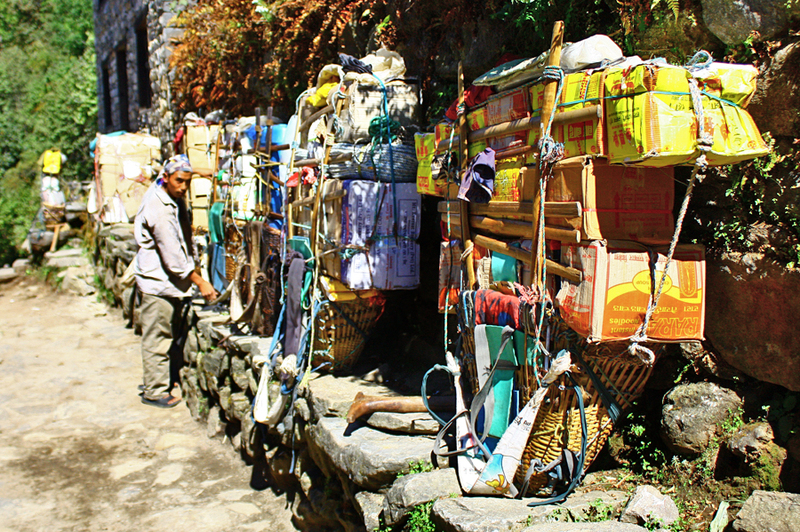 Colorful porter baskets waiting for their owners outside of a restaurant. 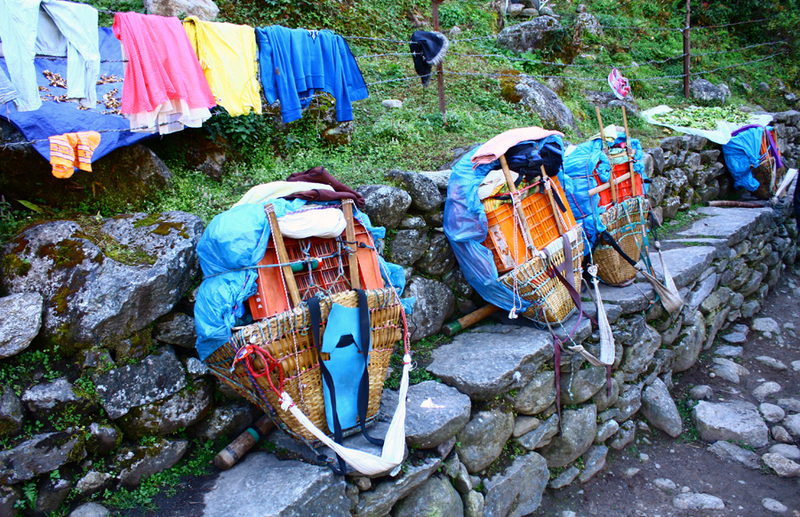 The porters just leave the baskets on a ledge and go inside to eat and drink. 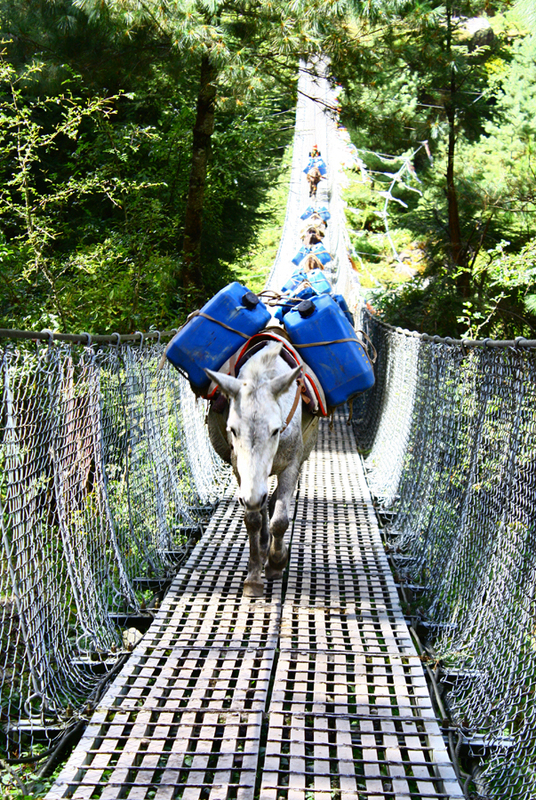 There were a lot of donkeys on the trail. It may have actually been national donkey parade day. 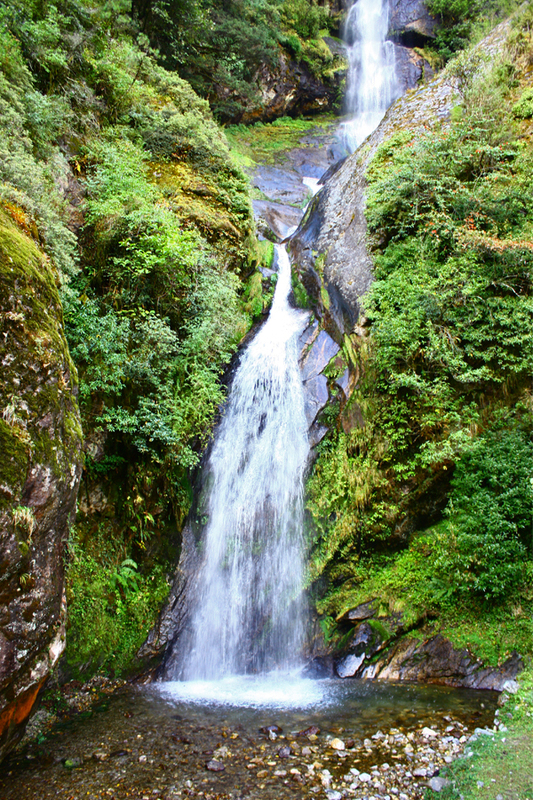 There were also very high bridges and waterfalls along the way, of course. No trail is complete without those. Everything felt like it was in stunning technicolor. 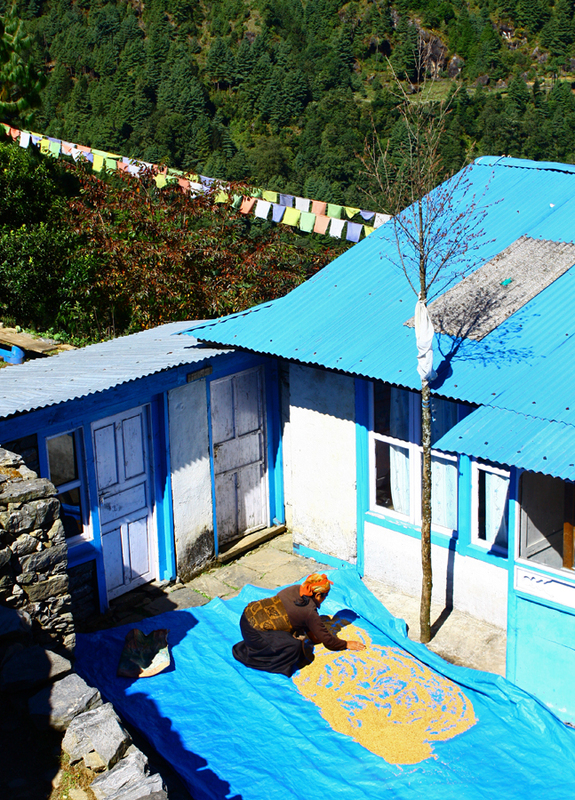 When we arrived in Phakding, we finally finally FINALLY had the opportunity to take a shower. 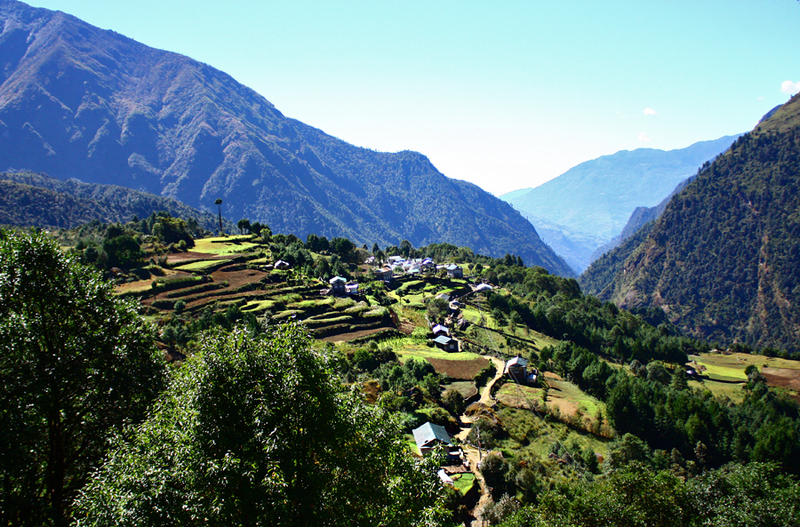 I won’t even mention how long I went without showering (it’s just not possible/practical at the higher villages along the trail). It was heavenly. 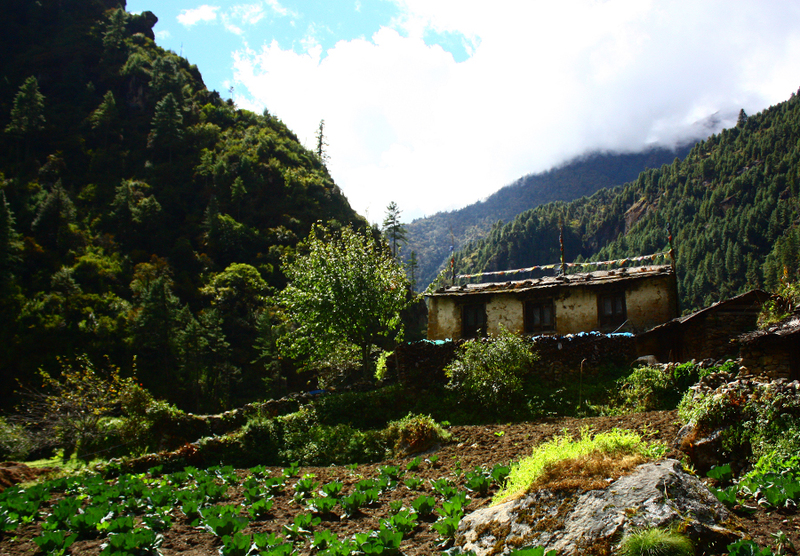 We camped in Phakding for the night again (and promptly lost electricity during dinner) and then set out for Lukla the next day. We promptly encountered a serious donkey traffic jam and had to take shelter on a restaurant balcony. 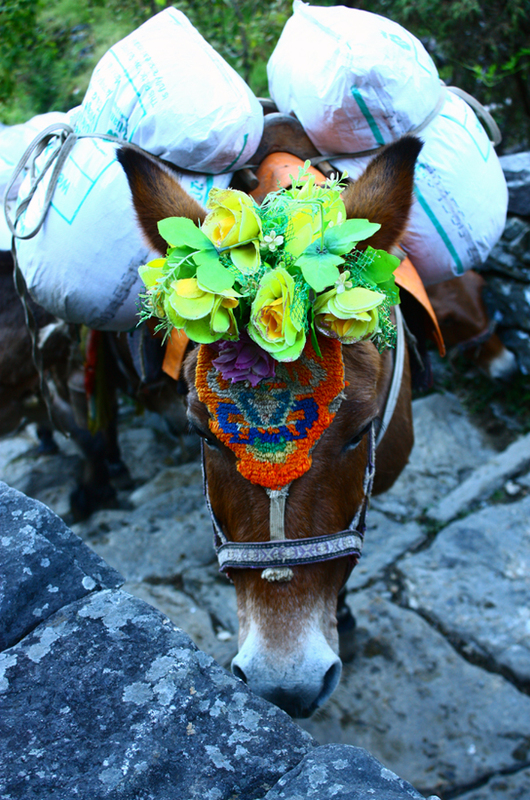 We were stuck there for about ten minutes but some of the donkeys were wearing flower crowns, so it was all good. When I said serious traffic jam, I meant it. 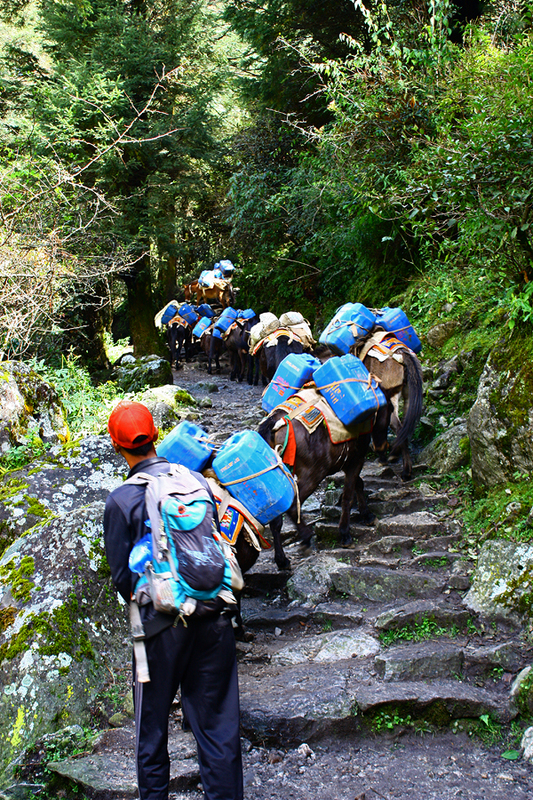 This isn’t even the same group of donkeys as above (you can tell from what they are carrying). They just kept coming! More donkeys. Forever donkeys. I didn’t know this many donkeys existed. I saw quite a few women doing this. The seed or spice is put on a tarp to dry in the sun. 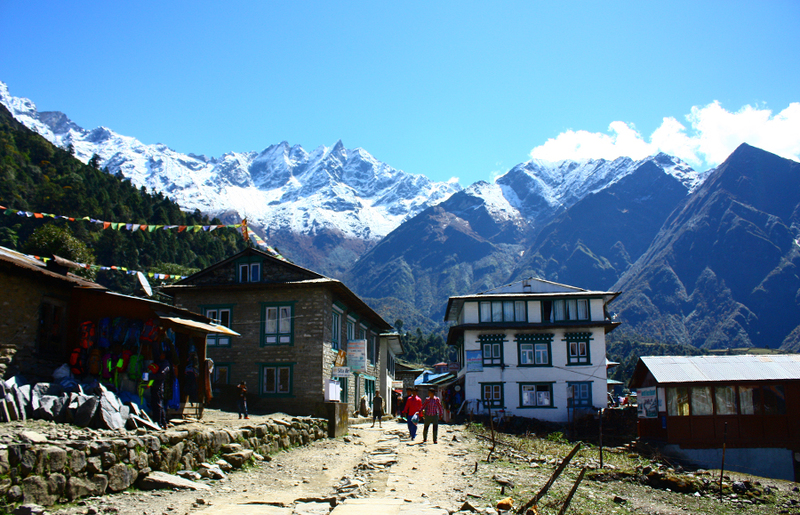 So the fun thing (read: not fun thing) about Lukla is that you actually need to ascend from Phakding to reach it. And as you can see from my pictures, it was very sunny and surprisingly warm. So that was an unpleasant last little jab that Everest got in. 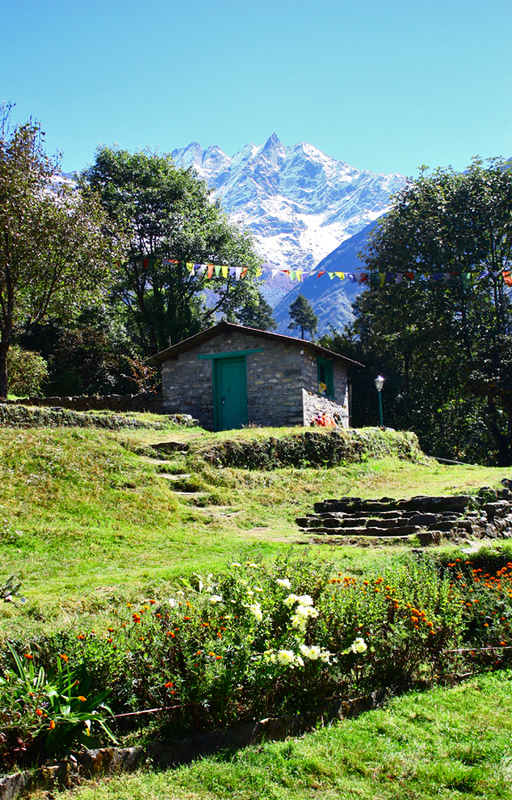 And we were back in Lukla! As a treat, we were staying in a lodge instead of a tent. The lodge, interestingly, was right next to the airport. And when I say next to the airport, I mean we were separated from the runway by a chainlink fence. I stood taking pictures of the incoming planes and helicopters. 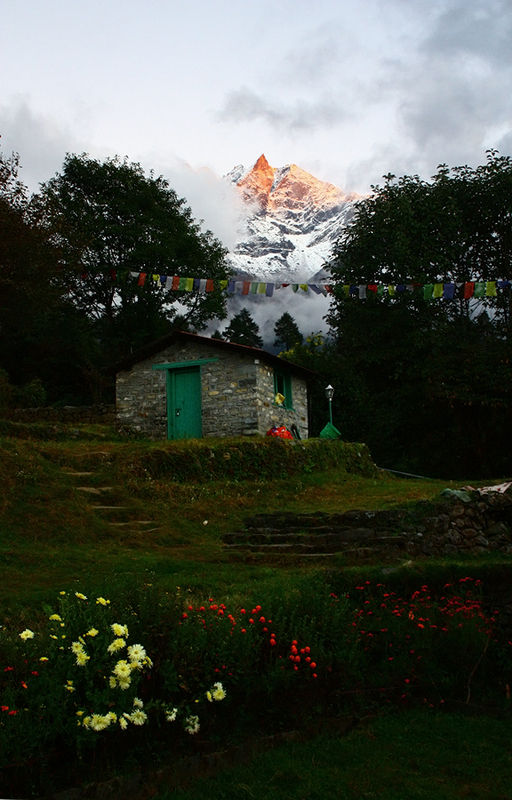 We sat and had tea in the yard of the lodge and I watched as the sun slowly went down. 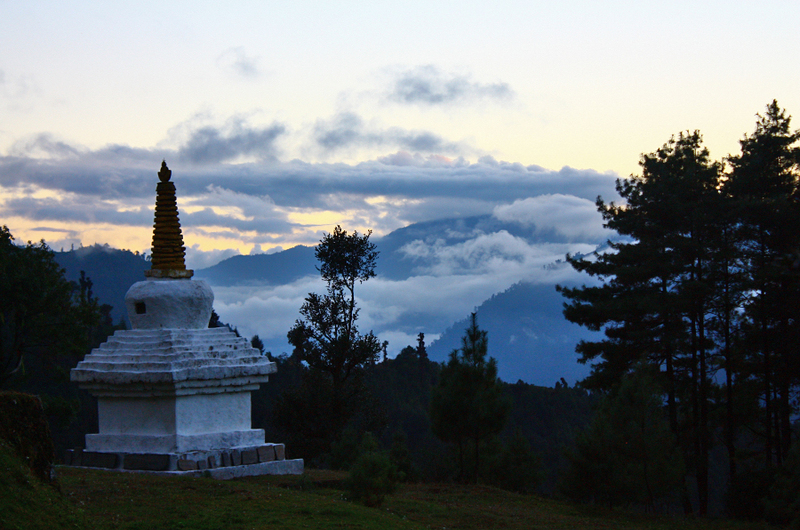 And finally the sun set in Lukla. The next day we were off to the airport…which, as mentioned, was right next door. 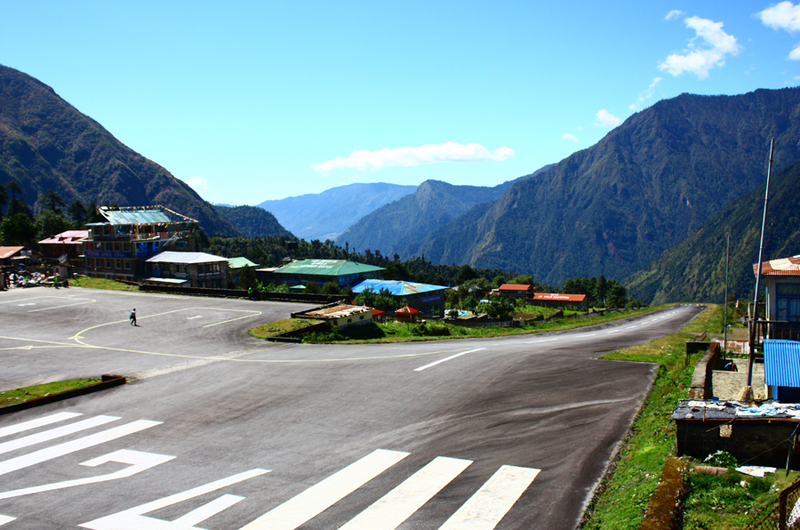 I have not yet mentioned the sheer terror that is the Lukla airport. See the end of that very short runway? That’s just a sheer drop off the mountain side. It’s pretty sink or swim. The airport itself is also a little chaotic. 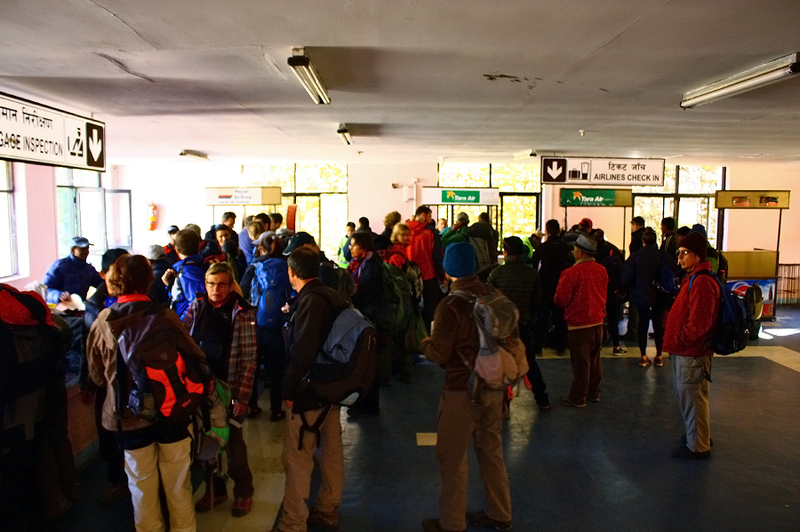 It’s just a crush of people jostling for tickets and bag inspection. That’s how it works– you show up and hope you get a ticket. The tickets themselves just have a gate number and nothing else. Your departure time is whenever it happens. After clearing security and getting into the little waiting area, I looked over to see many of the local young men transfixed by what was playing on television. What was playing? WWE wrestling! I kid you not. It’s incredibly popular there! 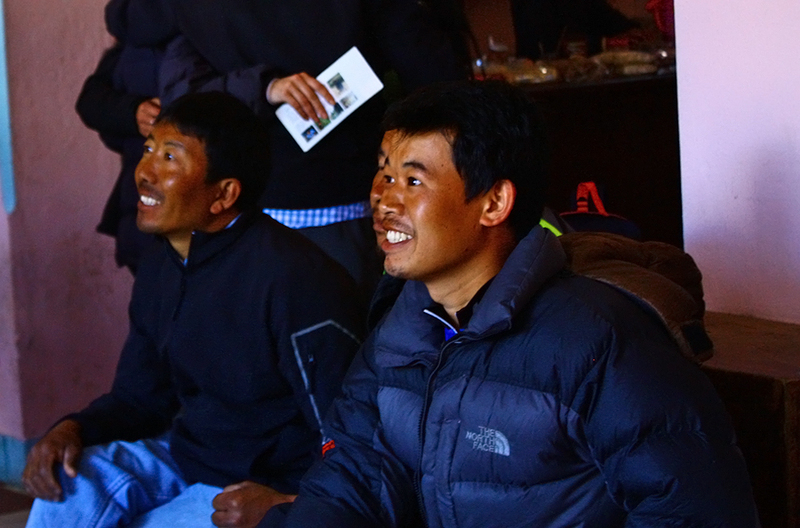 One of our sherpas excitedly told us about his favorite wrestler. So my Everest journey concluded with me sitting in the airport with a snow-capped mountain visible from the open window, watching WWE wrestling for the first time. 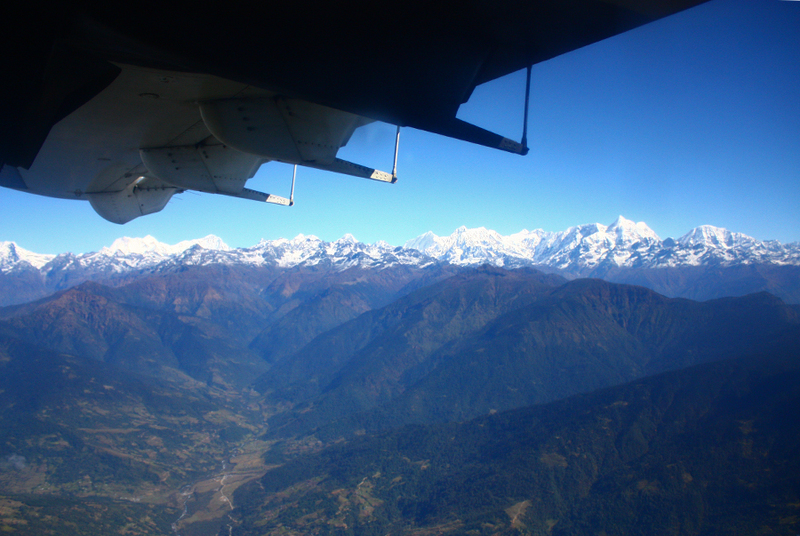 And then I boarded my tiny plane and said goodbye to the Himalayas. 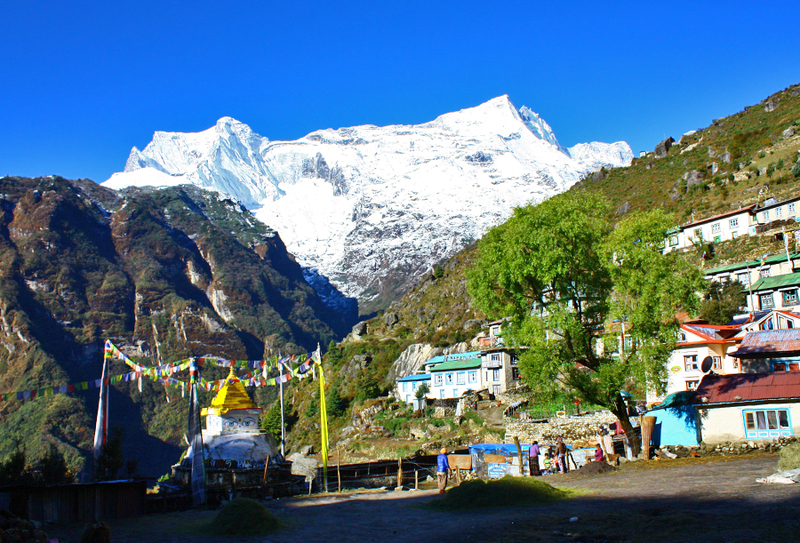 And the Everest adventure continues! 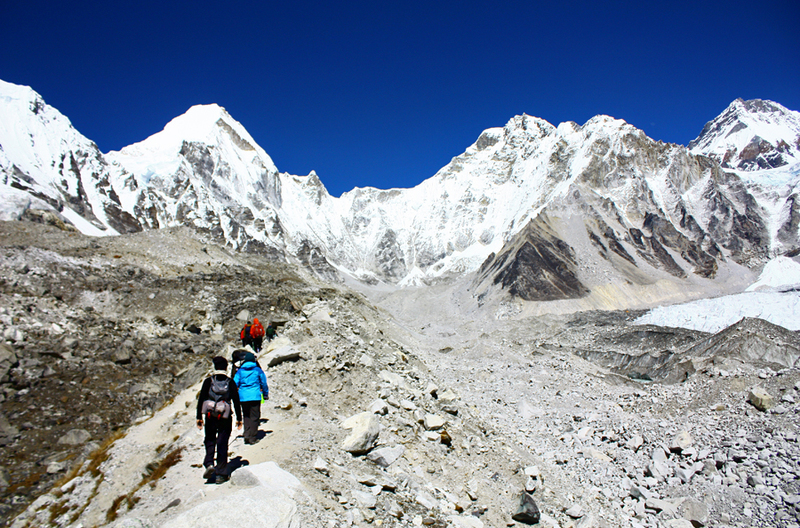 We’re going to make it to Base Camp this time! This leg of the trip is most seared into my brain, so get ready for some dramatic, verbose writing! 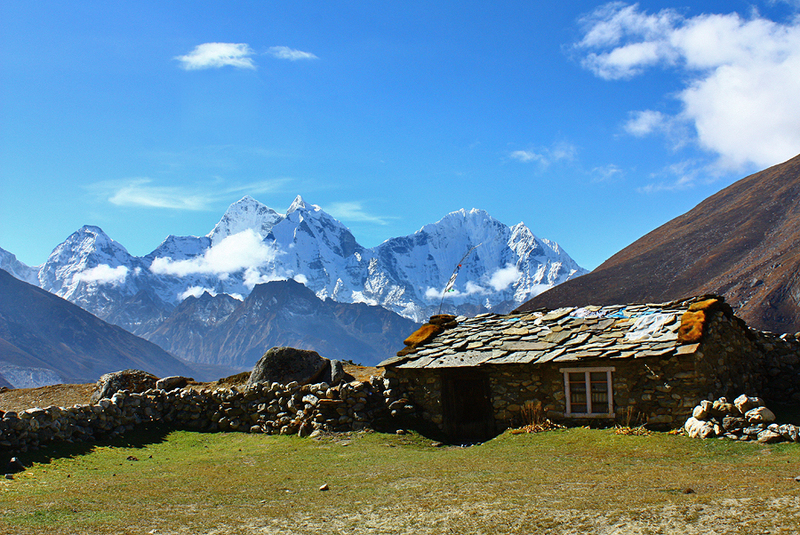 So after two nights in Dingboche, it was time to leave for the very tiny village of Lobuche. We packed up and took the same route we had the morning before for the day hike. Taken about a minute after we left. We retraced our steps about halfway up the mountain nearby and then turned off on a path that was being guarded by a pair of very lazy dogs. (They weren’t really guarding anything; they were fast asleep in the sun). 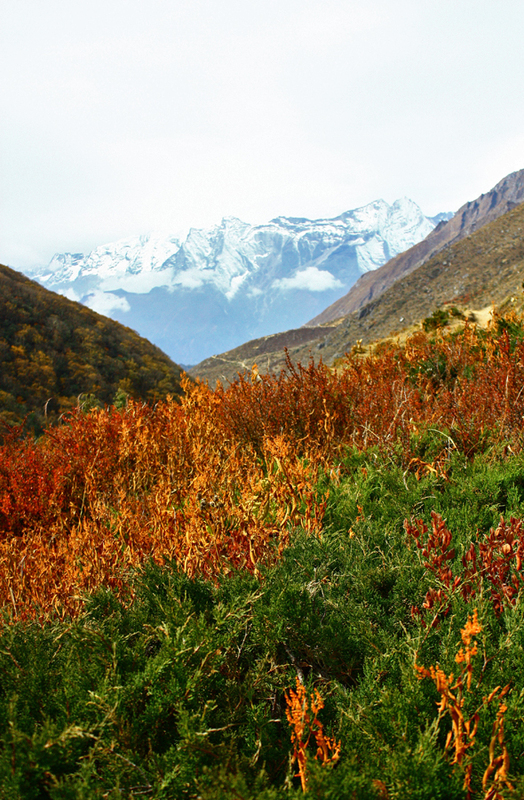 We were immediately treated to more breathtaking views of the surrounding mountains. As you can see above, we were not the only party on the trail. 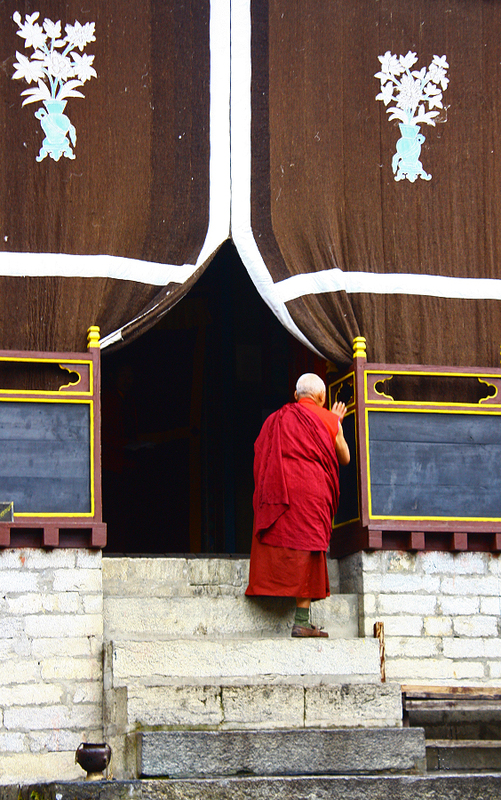 We passed some dzopkyo going about their business. I know how they feel, struggling uphill. 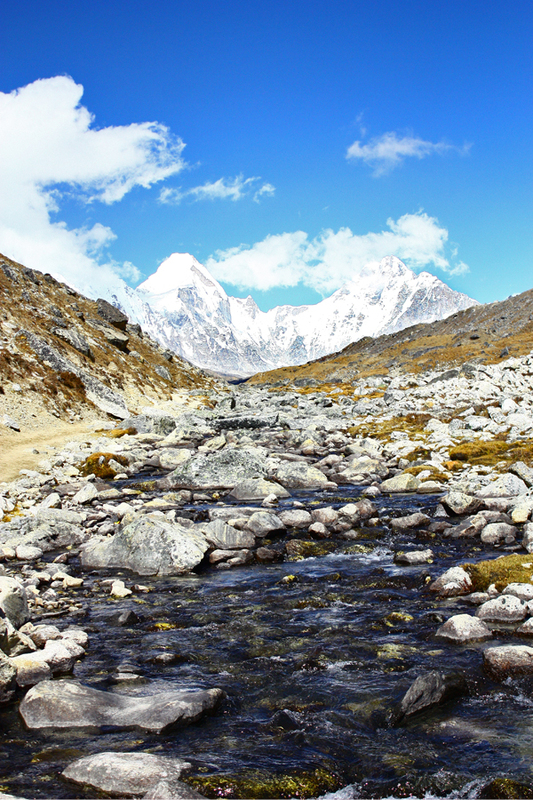 The initial trekking was pleasant enough, as it was on even(ish) ground without many rocks. We got a view of the town of Pheriche from above. See those little fields and buildings below? Pheriche! There will be more on Pheriche later! We also passed this adorable little abandoned(?) cottage. After a good dose of walking across an open valley plain, we veered onto a path that wound around the side of a mountain. After more demented ribbon candy path trekking, we crossed a bridge over a channel of water and then had to climb back up. This is when things began in earnest. Here we see a toiletus sheet-metalus in its natural habitat. A note now on the toilets. Do not go on this trip if you cannot deal with bad toilets. And I mean bad. The toilet pictured above is actually pretty nice. 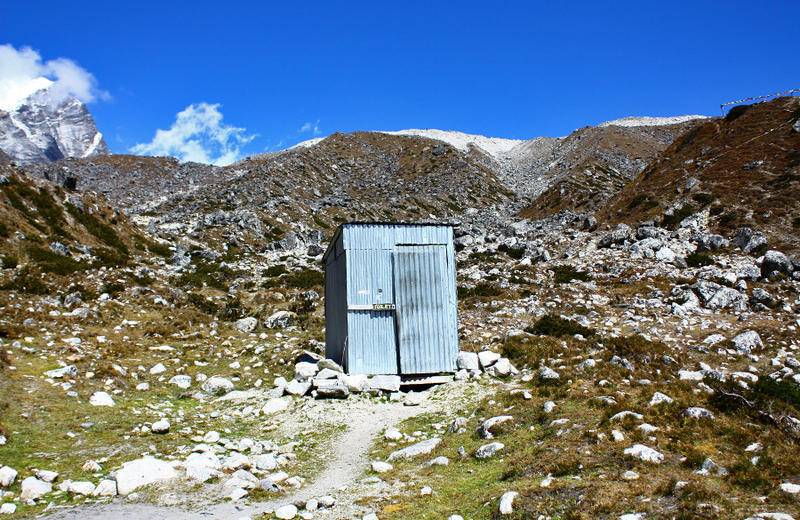 I won’t go into the gory details, but most toilets on this journey consisted of a hole in the ground and squatting in cold and dark places. I will say that you do get used to it and once you return, you have a new found appreciation for Western toilets and indoor plumbing (at least I did). It was fairly sobering. 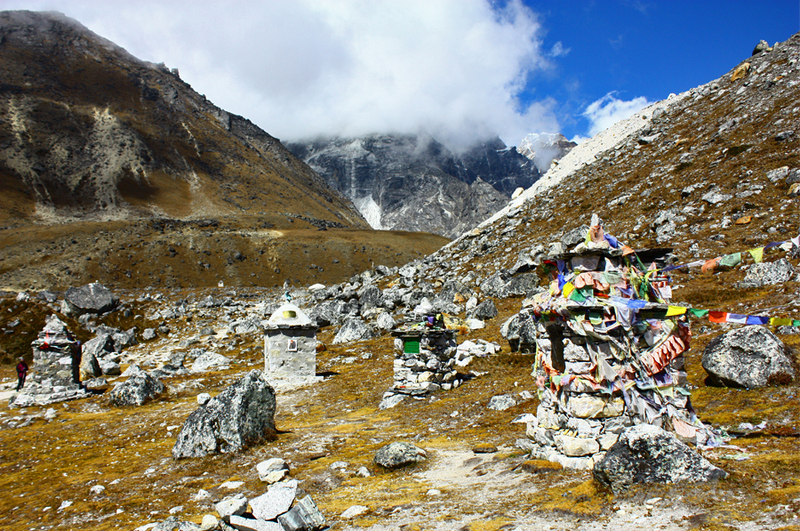 These were all memorials dedicated to men and women who had died on Everest, either summiting or, in at least one case, on the trail to Everest Base Camp. I immediately recognized this memorial, of course. 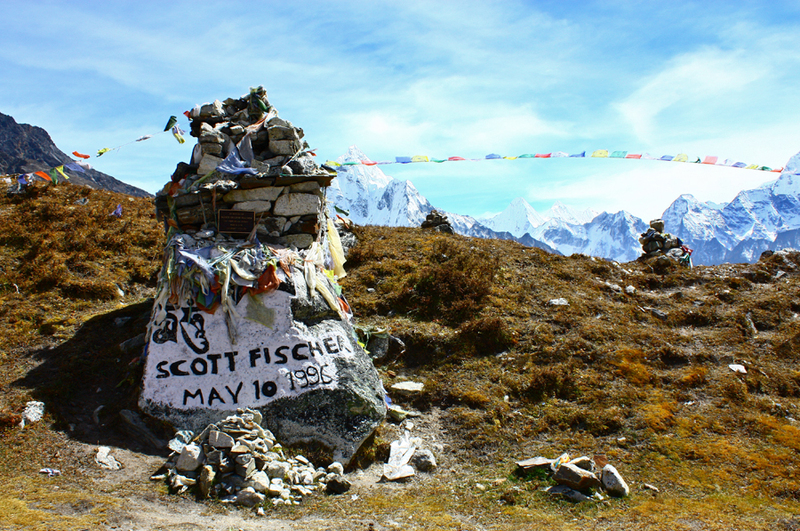 Scott Fischer was one of the casualties in the 1996 Everest disaster and a main character in Jon Krakauer’s book Into Thin Air. 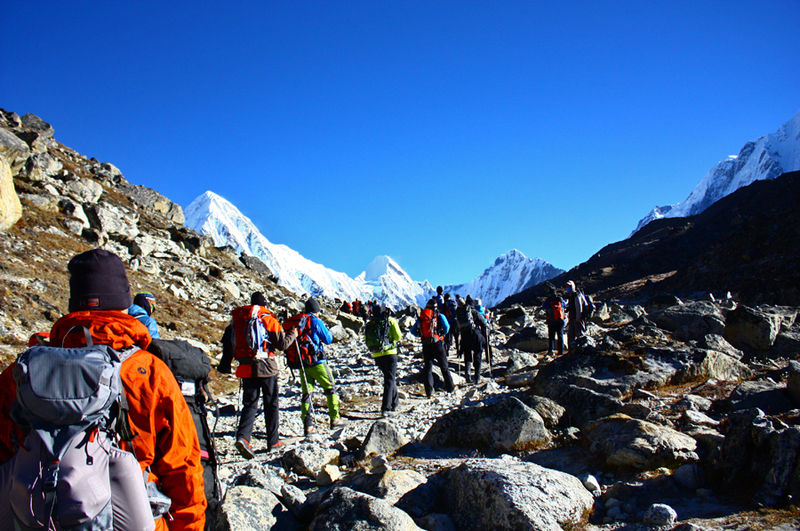 After a rather somber break, we continued on towards Lobuche. 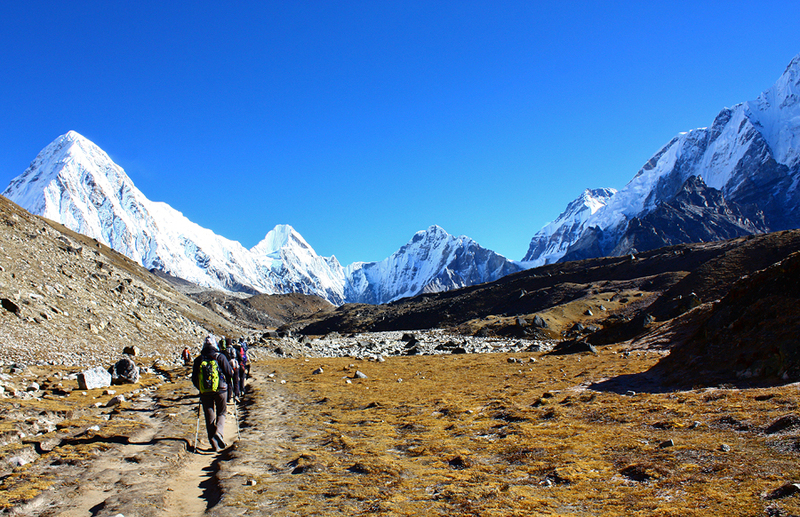 The trekking at this point was far easier (although rocky) and, in my opinion, one of the most beautiful days. This is the view once you leave the memorial field. 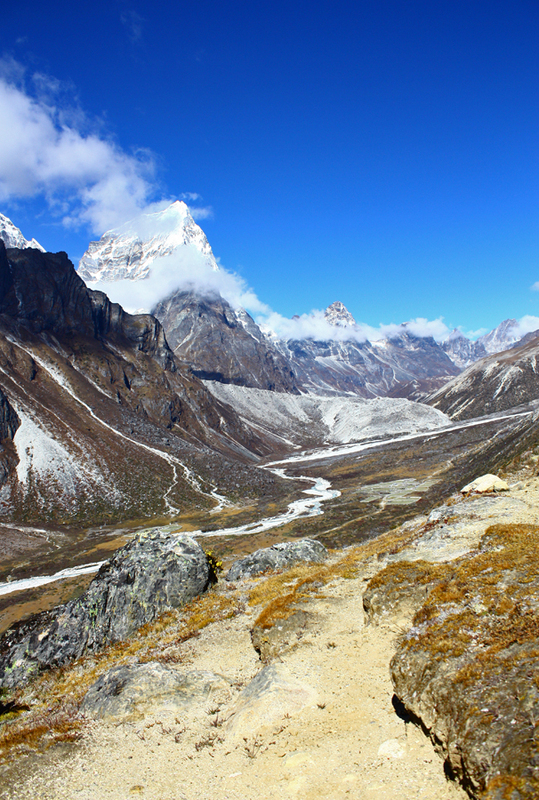 This was probably my favorite stretch of trekking. I cannot describe just how beautiful it was in person. The pristine white mountains in the background absolutely glowed. 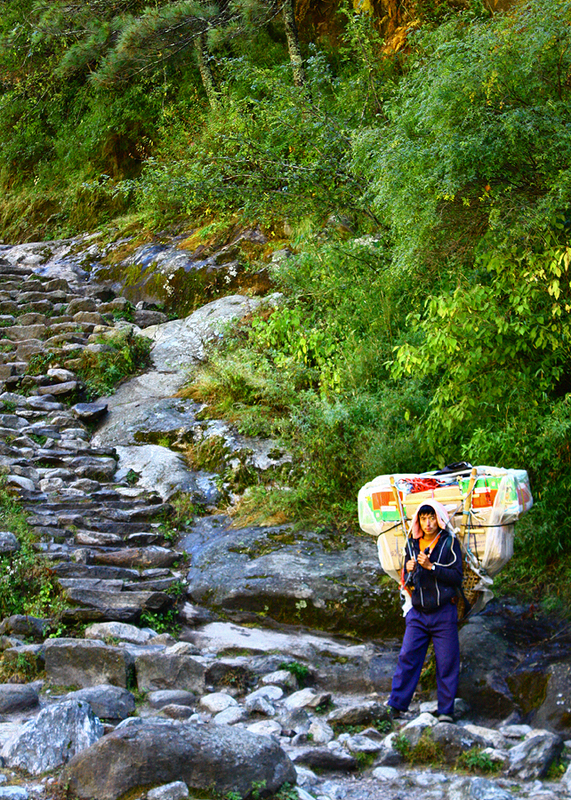 Here are two porters with colorful bags having a conversation. I genuinely admire how hard working these guys were. I can’t imagine carrying all that baggage! 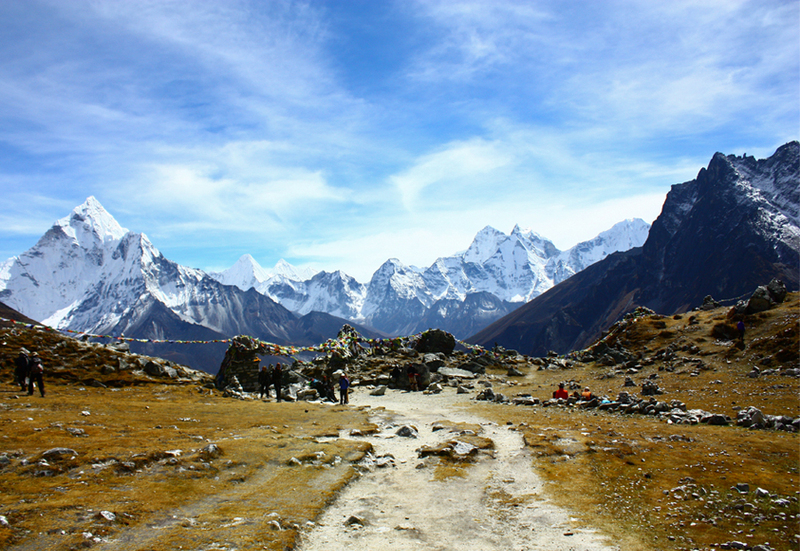 And so, after about an hour or so of walking among the bleached rocks towards those mountains, we reached Lobuche. 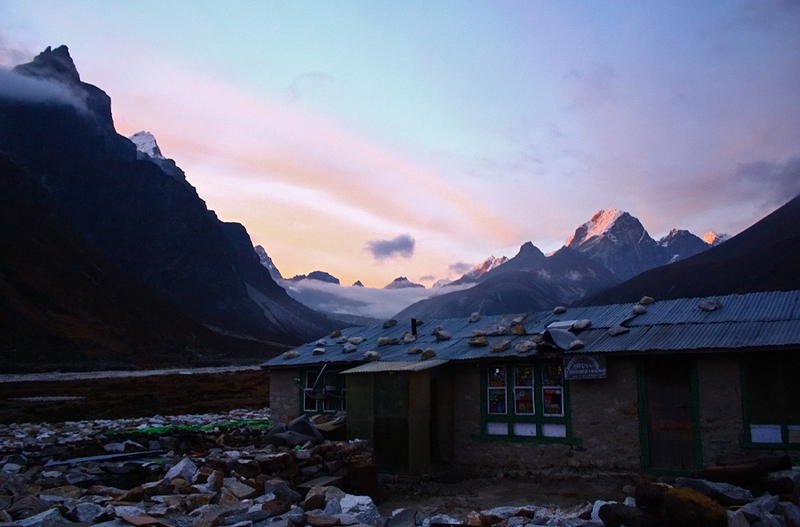 We did not stay in tents at Lobuche because it was so cold. We instead stayed in a lodge. Well. To put it politely, I was not a fan of this lodge. I genuinely believe that the construction was overseen by the Joker. It was constructed entirely of thin plywood, and nothing fit together as it should have (including doors and door frames). The long hallway to the bathroom was dark and Kubrickian. It looked like the set of a horror movie, and I honestly would have preferred sleeping in a tent. It didn’t help that I was tired, sick, freezing, and struggling to eat anything. The next day was better. 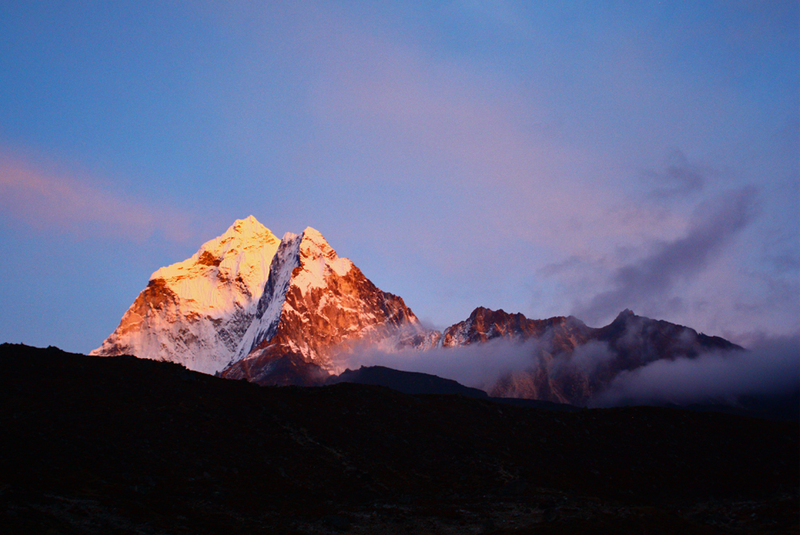 We left Lobuche bright and early with everyone else in town. This should disabuse you of any ideas of being alone on the trails. 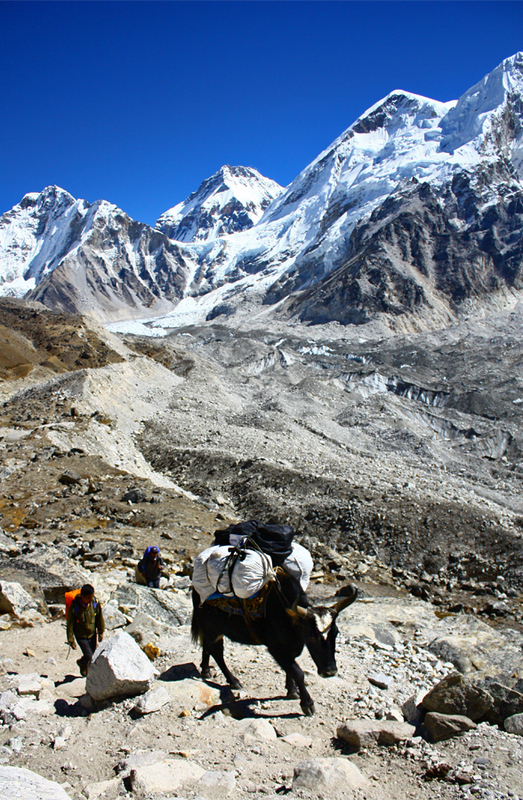 We were headed now to Gorak Shep, the last small outpost before Base Camp. 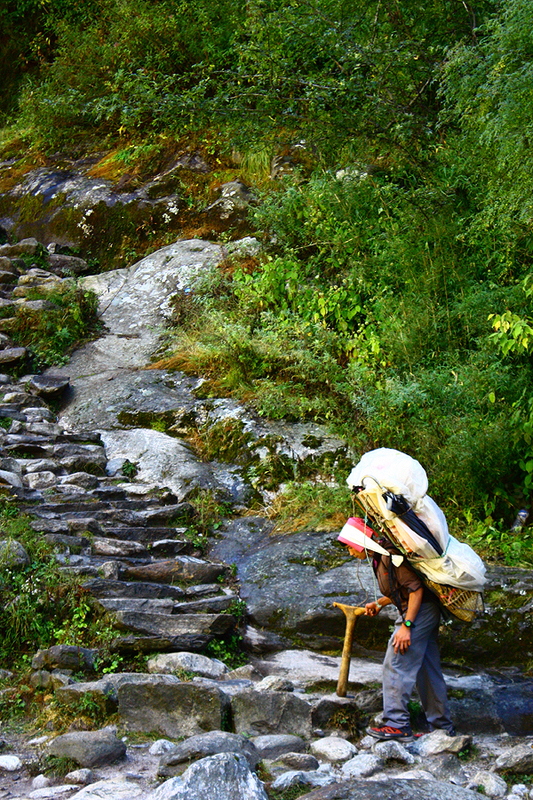 The initial trekking, as you can see above, was not so bad. It became more intense as we went on. 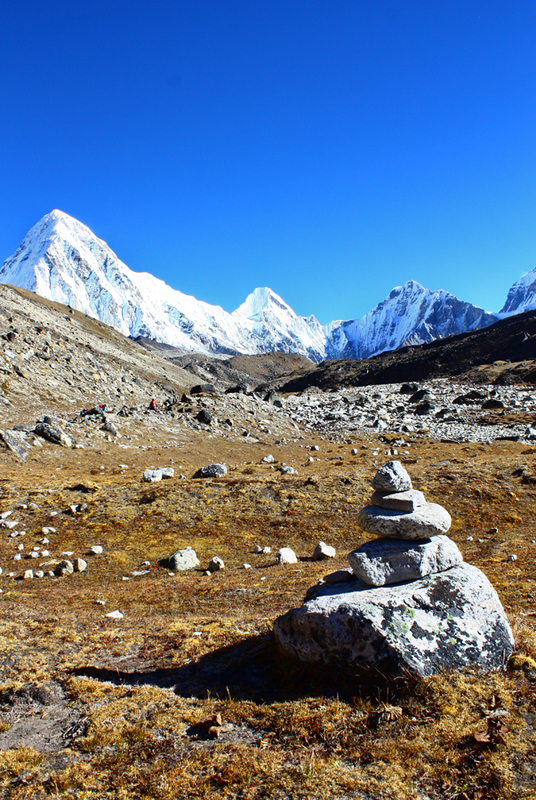 Stacked rocks on the beginning of the trail to Gorak Shep and a dzopkyo near the end of the trail. An avalanche! Thankfully, this was nowhere near the trails and therefore no one was hurt/in any danger. 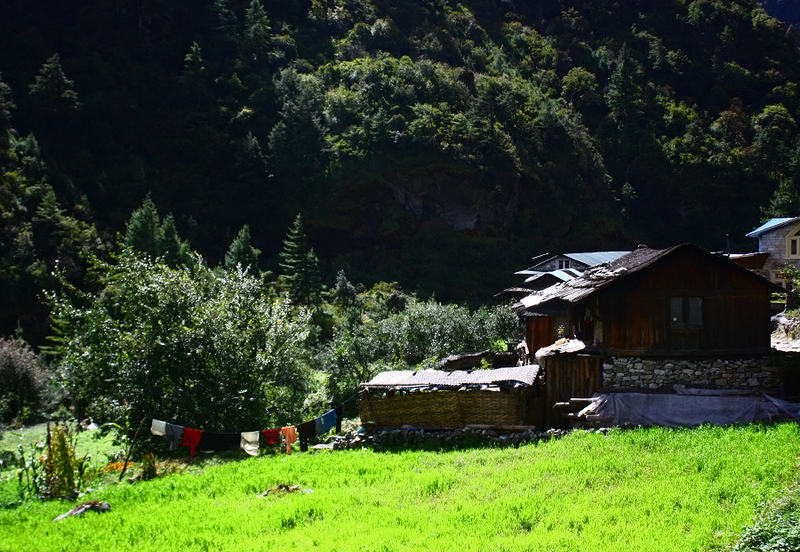 After about 3 or 4 hours of trekking, we reached Gorak Shep. All of the buildings looked brand new! HA! No. 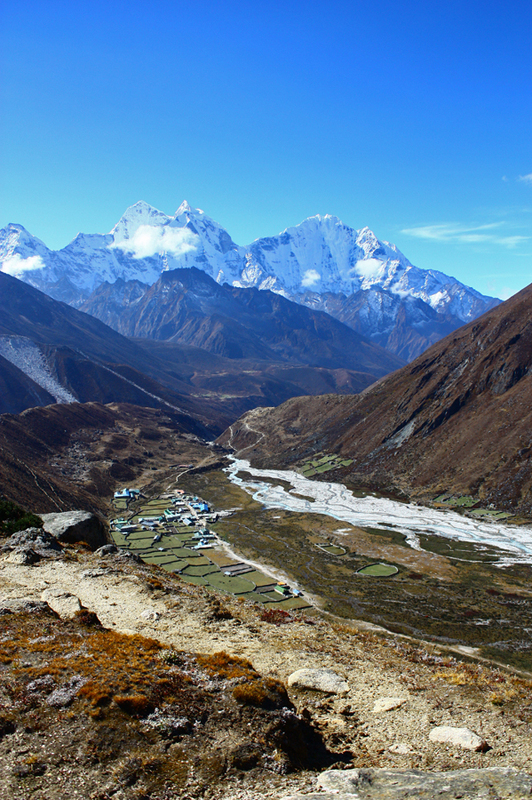 After reaching Gorak Shep, we ate a quick lunch and then pushed on to Everest Base Camp. 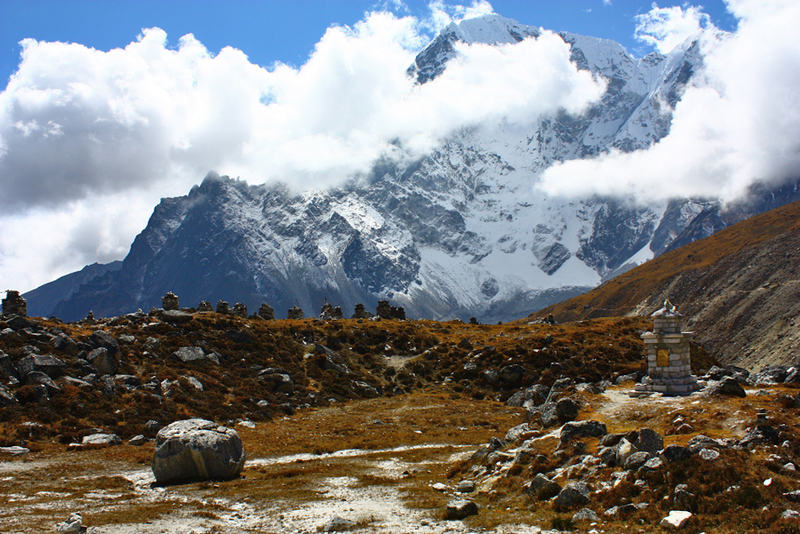 This was the absolute most intense part of the entire trek. We were all freezing and exhausted. 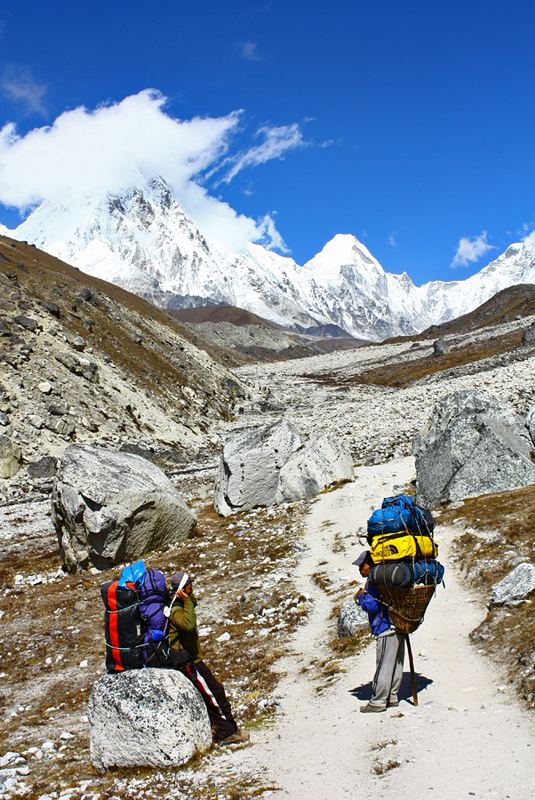 Two of the four of us had to have the sherpas carry our packs (I did not). It was like trekking on the surface of the moon. There was almost no vegetation. 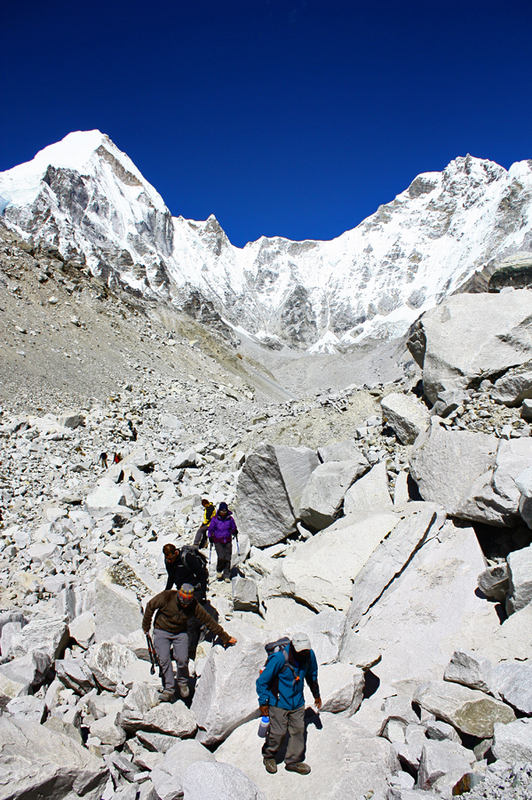 The path to Base Camp was also the most treacherous, with an incredibly uneven and rocky trail. As a result, I spent most of my time forcing myself along and trying not to fall over. Because of my lung infection, I spent all of our rest breaks coughing nonstop (for whatever reason, if I was moving, I was too busy trying to breathe to cough). I didn’t take a huge amount of pictures along the way. At this point, we were at approximately 17,500 ft above sea level. 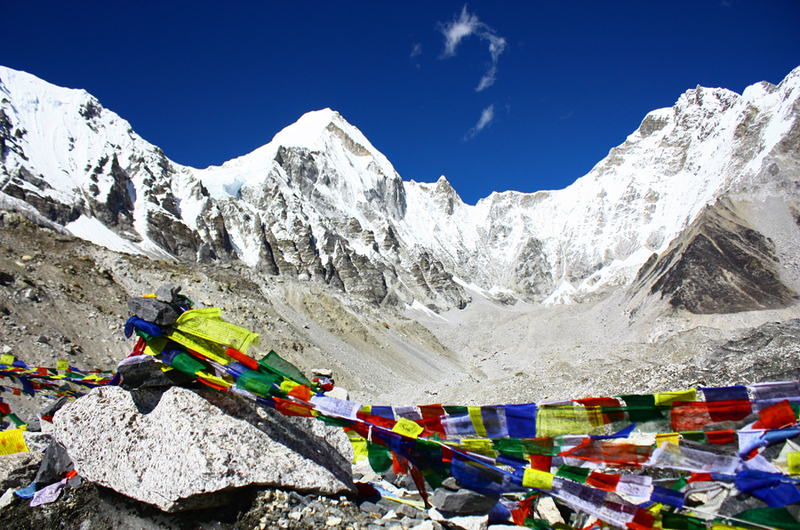 It’s difficult to describe the challenge that such high elevation and thin air brings. 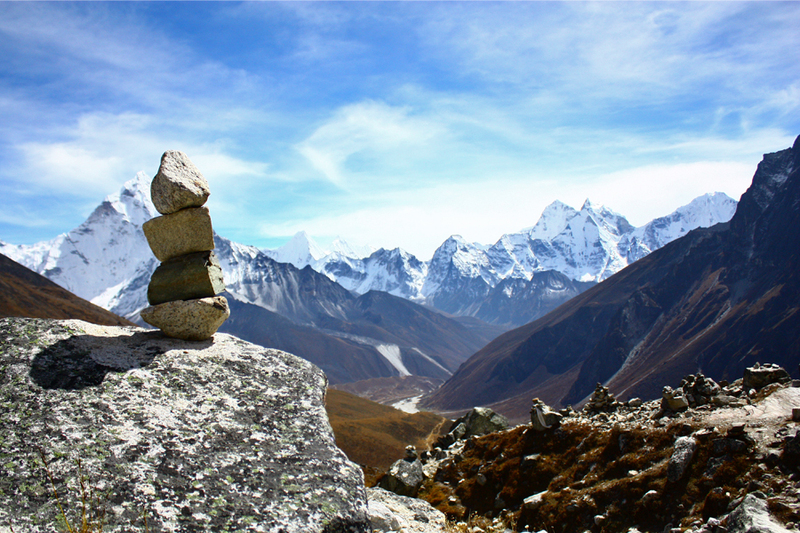 Even with Diamox (a medication to prevent altitude sickness), you struggle to find an appetite, to sleep, and to exert yourself. Physical tasks that would be simple at sea level are now serious physical exertions. You have also spent the past nine days or so getting to this point. That level of fatigue drains you. And in my case, it hurt my damaged lungs to breathe in such cold air. You really have to keep a positive attitude and push yourself to get there. This was the final ridge we walked along to reach Base Camp. 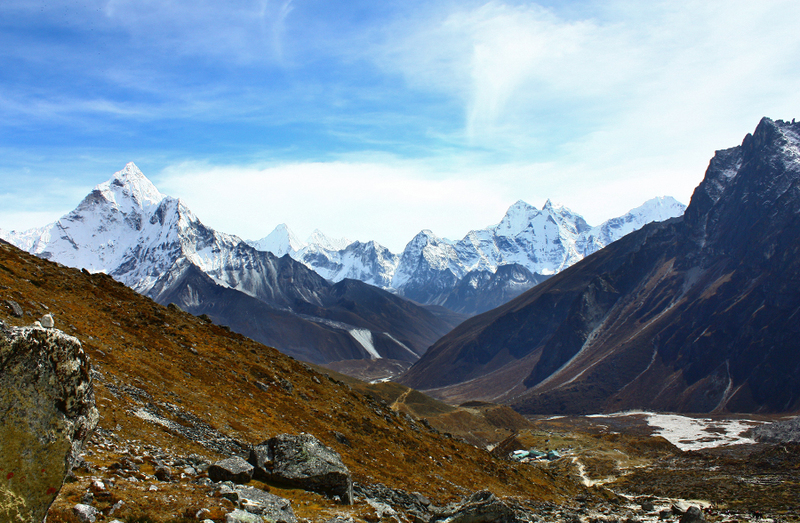 (Descending from this ridge, however, there was still more light rock climbing to be done before you reached Base Camp…it wasn’t just a direct trail there). From this ridge (but not visible in the picture) you could see Base Camp. If you looked down from the ridge, you could see glacial lakes. 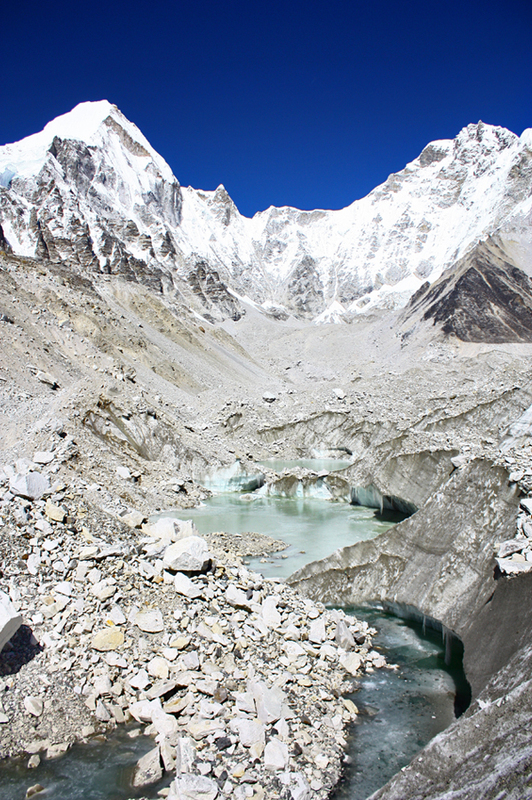 On the picture to the left, you can see the glacial lakes from the melted parts of the glacier. 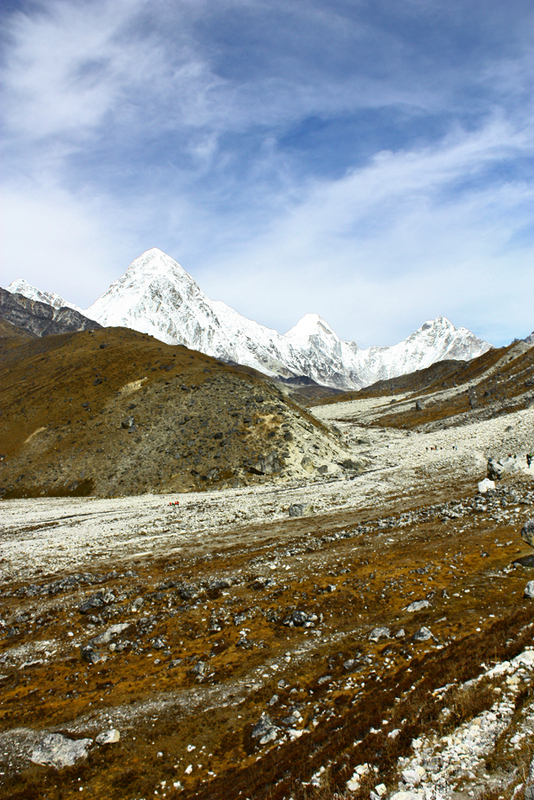 Note that all of this trekking was on the Khumbu Glacier. Beneath the rocks, you could see ice. 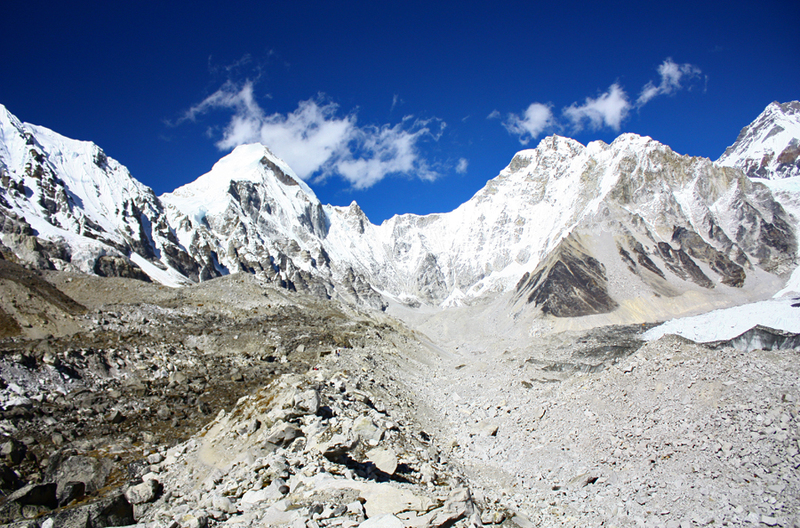 To the right are the rocks you must climb up and down on to reach Base Camp. Your trekking poles won’t help you here (though I didn’t use any, so they never helped me). There really isn’t very much at Base Camp. 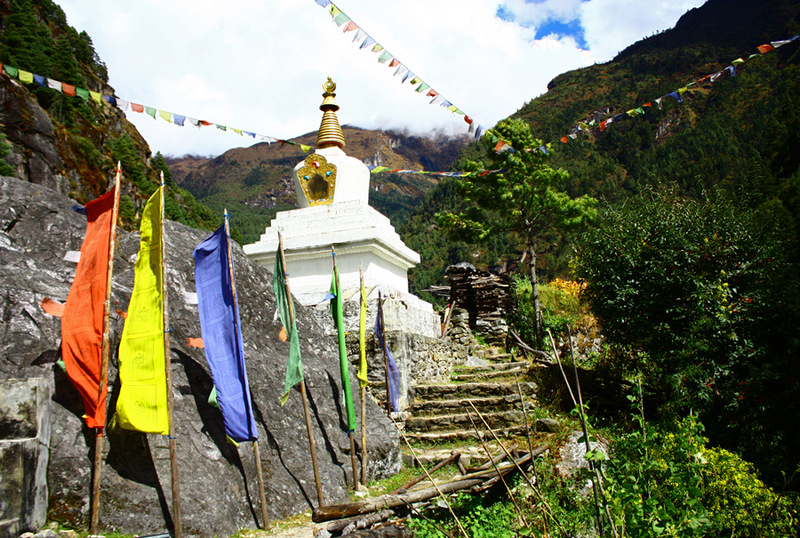 There were some prayer flags (as you can see above), a biting wind, and fellow trekkers who looked like they could be on the cover of Fit Young Hikers magazine. But it was incredibly gratifying to know that I had made it. 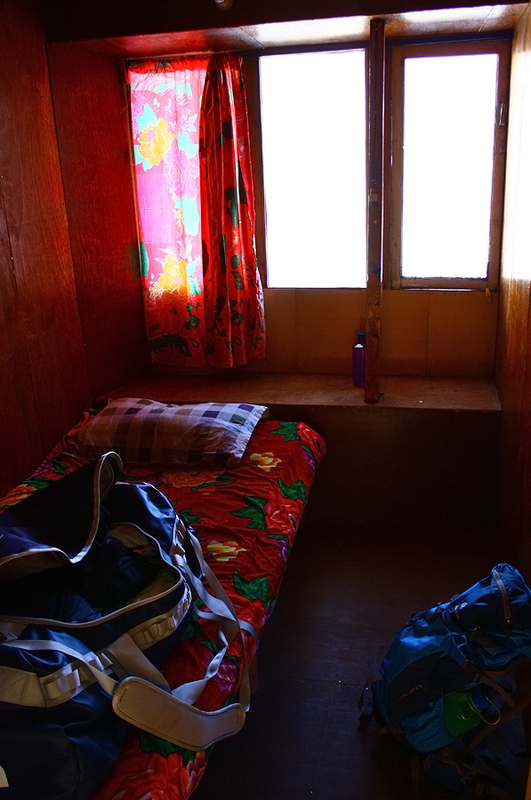 In something of an exhausted daze, we retraced our steps and made it back to Gorak Shep, where we also stayed in a lodge due to the freezing temperatures. 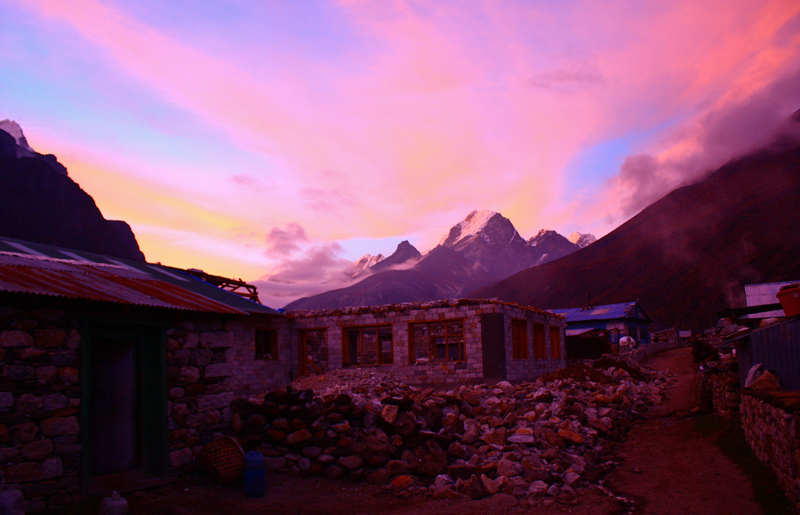 Not the Hilton, but far nicer than Lobuche! I woke up the next morning to a complete frost on the inside of the window. 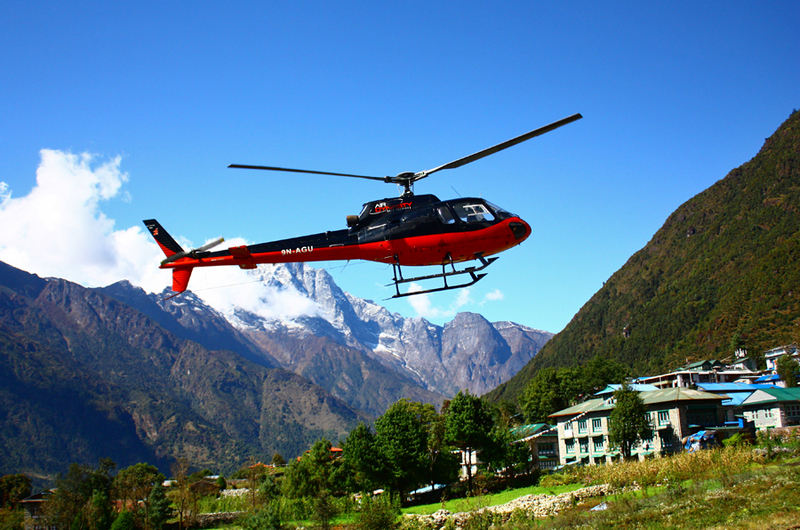 During breakfast, it was decided that two of our group members would be helicoptered out and taken to Kathmandu because they were so ill. After that rather grim news, the rest of us quickly began our descent down. We took the same path as we did on the way up. Because we were descending and entering more oxygen-rich air, it went much quicker. 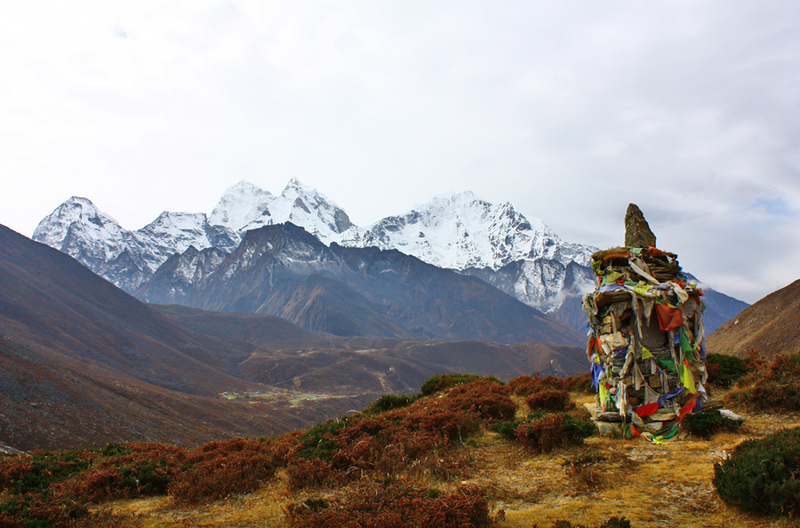 We stopped for lunch in Lobuche (where I happily watched the proprietress of the tea lodge knitting a hat) and continued our way down though the memorial field. The memorial field on the way down. This was the view from our descent from the memorial field. 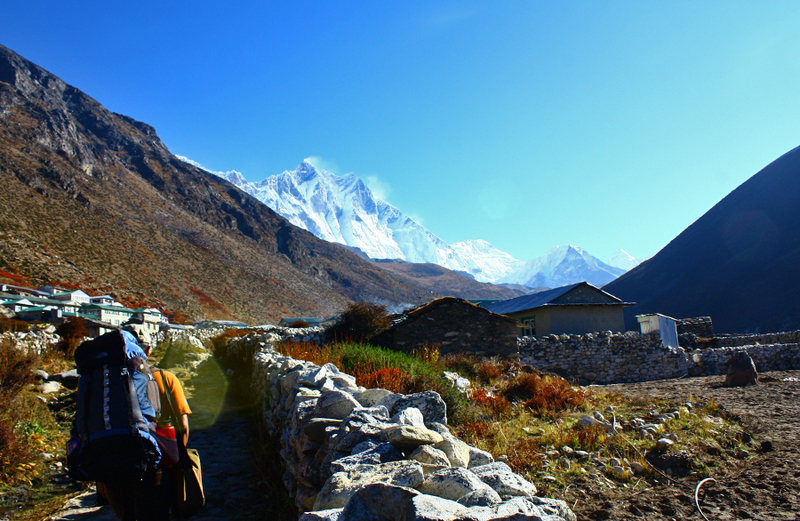 We used the path that we had taken from Dingboche to Lobuche. 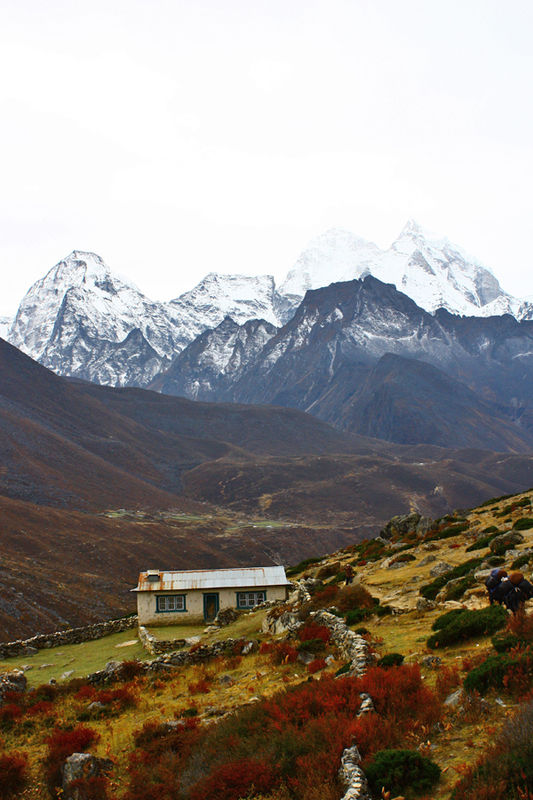 However, once we reached a certain point, we turned and descended down instead of continuing on to Dingboche. After about an hour and a half of walking on a loooong rocky field (I almost tripped about five times), we reached the small town of Pheriche (remember the picture at the beginning of this entry?). We tented down and enjoyed a nice afternoon tea. While reading a book in the tea lodge, I looked outside and noticed that the sun was setting. It was absolutely freezing out, but I’ll do almost anything for a photo. I ran outside and took photos until my hands were numb. 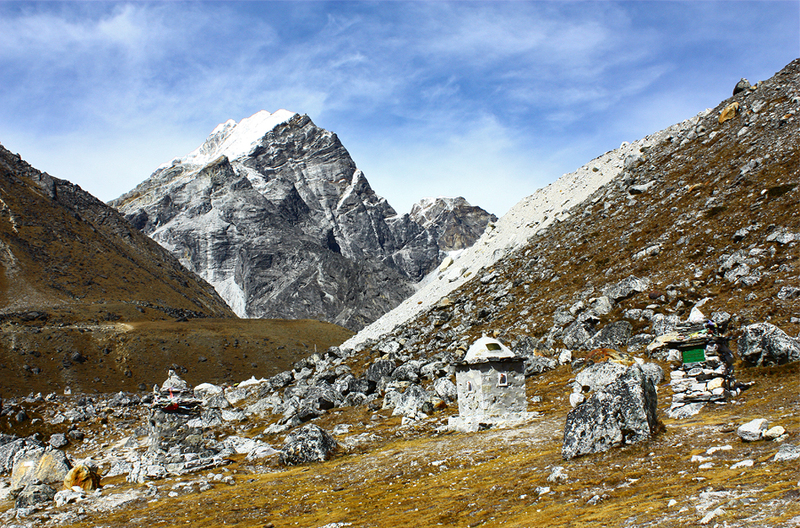 Like most places along the Everest Base Camp trail, Pheriche is undergoing a lot of construction! 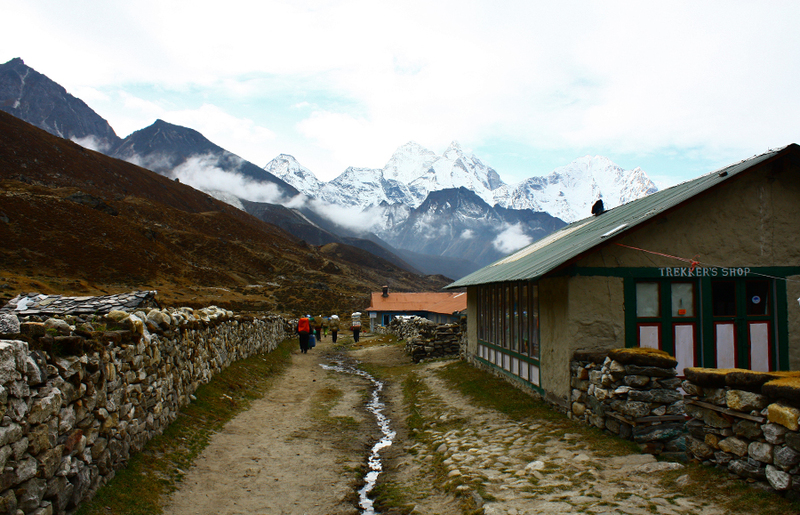 Looking towards the trail out of Pheriche at a Trekker’s Shop. 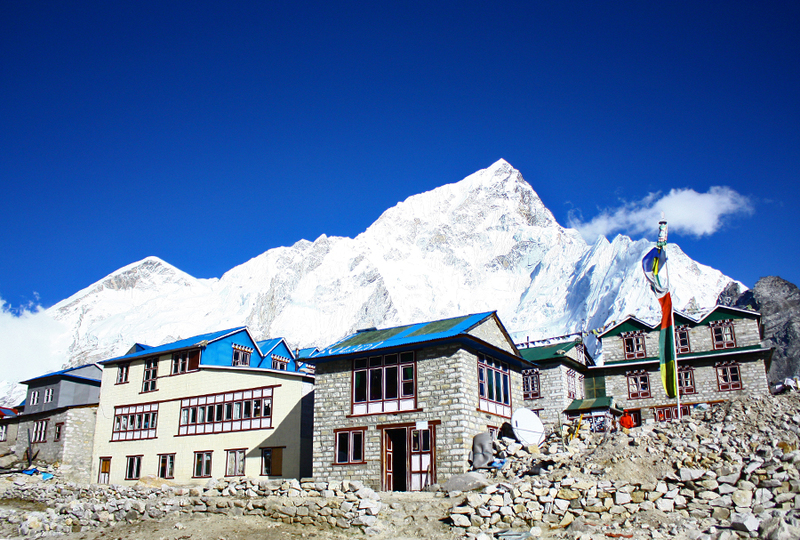 Here is another building that is undergoing construction, with a mountain range in the background. The sunset reflecting off of a peak in the distance. And so began our descent down. We actually took a different path down than we did going up, so I will cover that in the next entry!